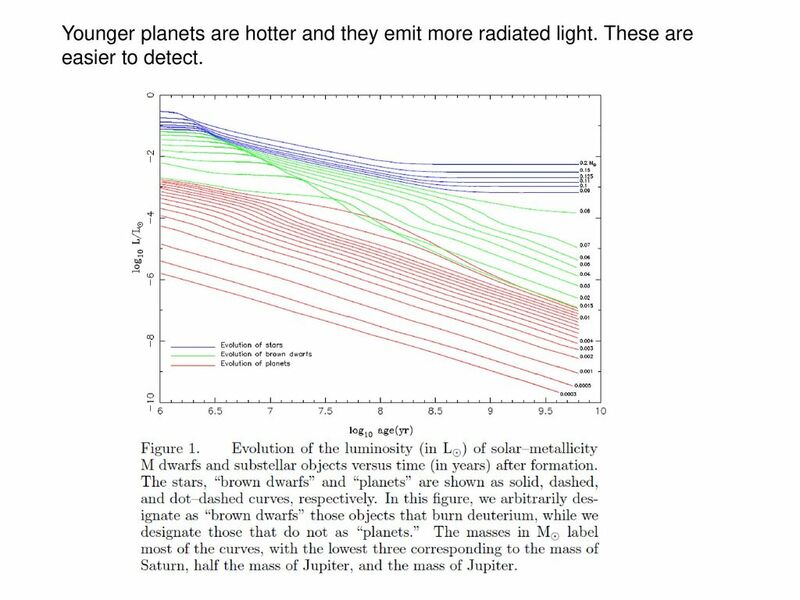 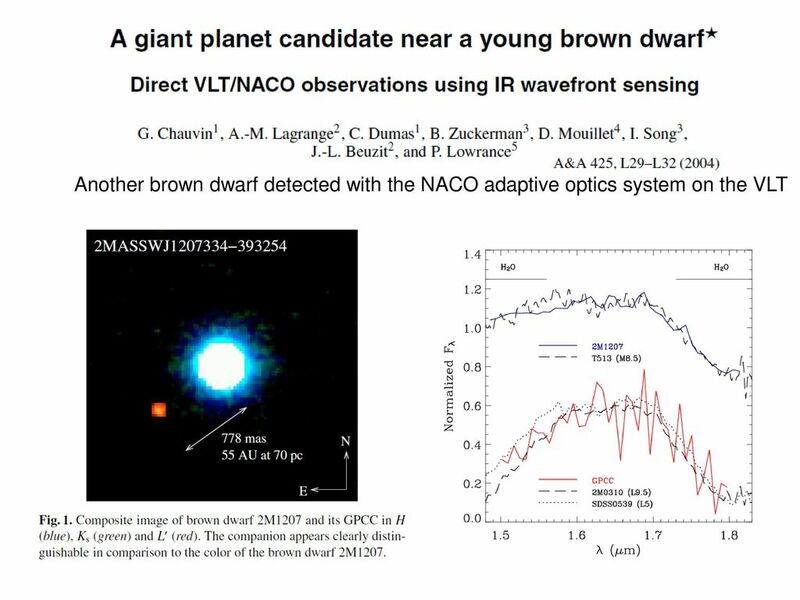 Younger planets are hotter and they emit more radiated light. 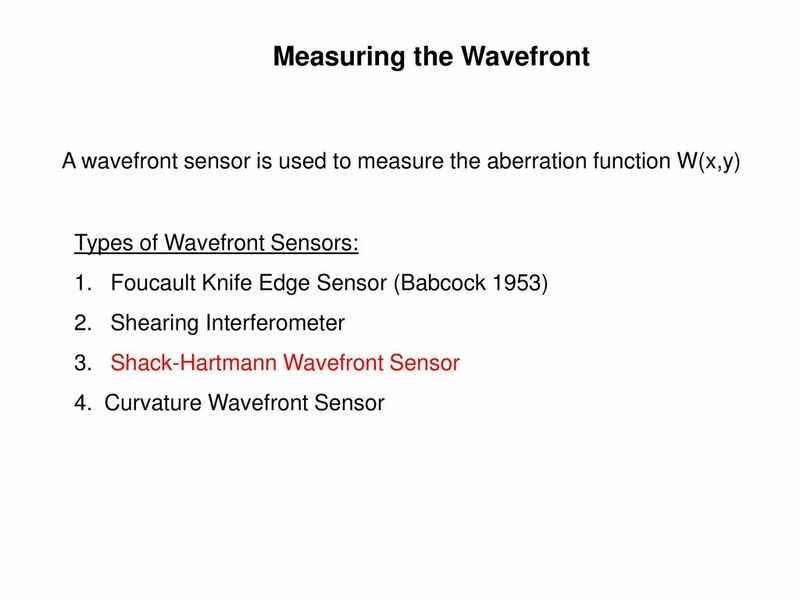 These are easier to detect. 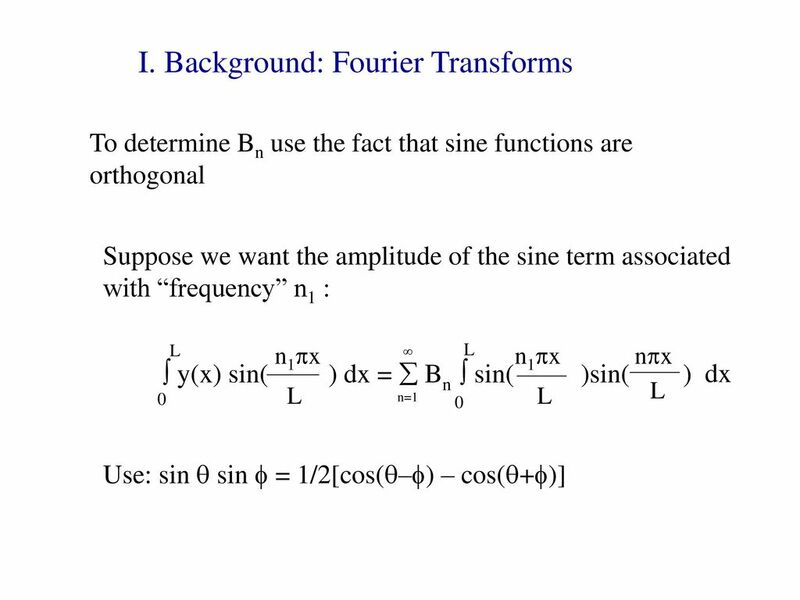 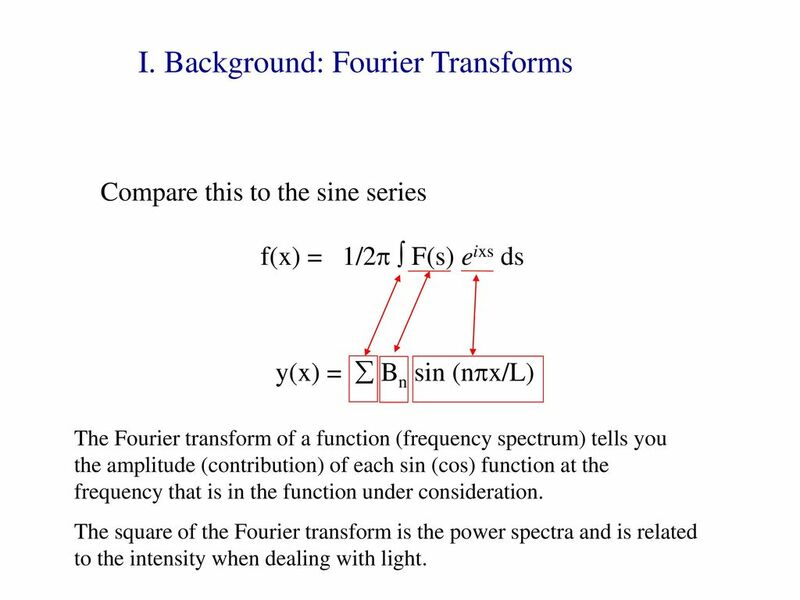 Compare this to the sine series f(x) = 1/2p  F(s) eixs ds y(x) =  Bn sin (npx/L) The Fourier transform of a function (frequency spectrum) tells you the amplitude (contribution) of each sin (cos) function at the frequency that is in the function under consideration. 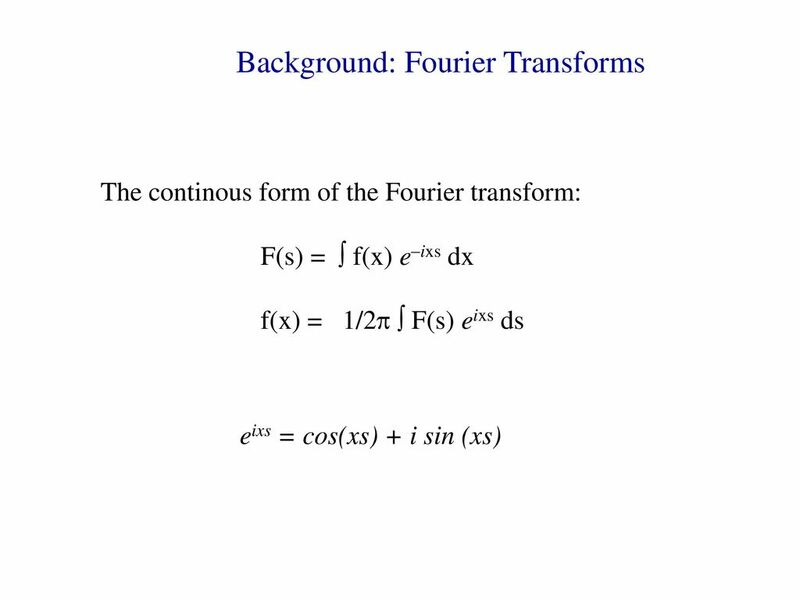 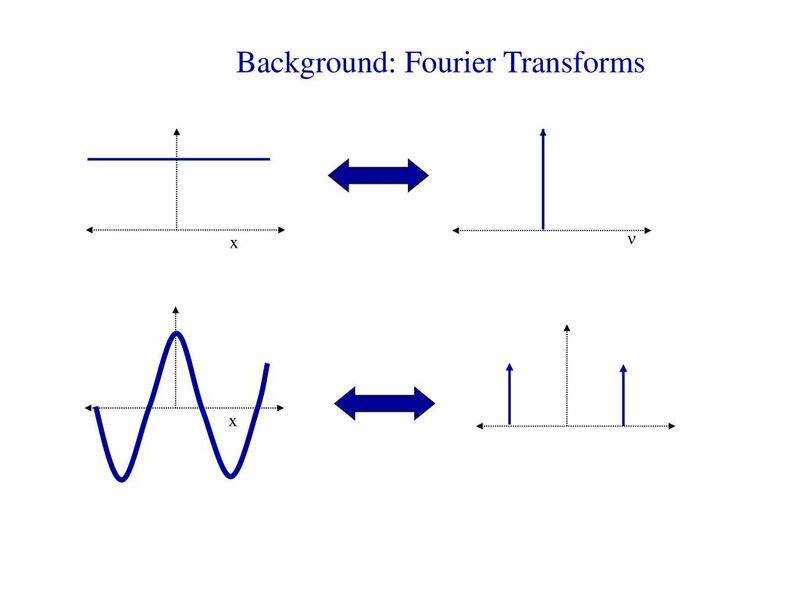 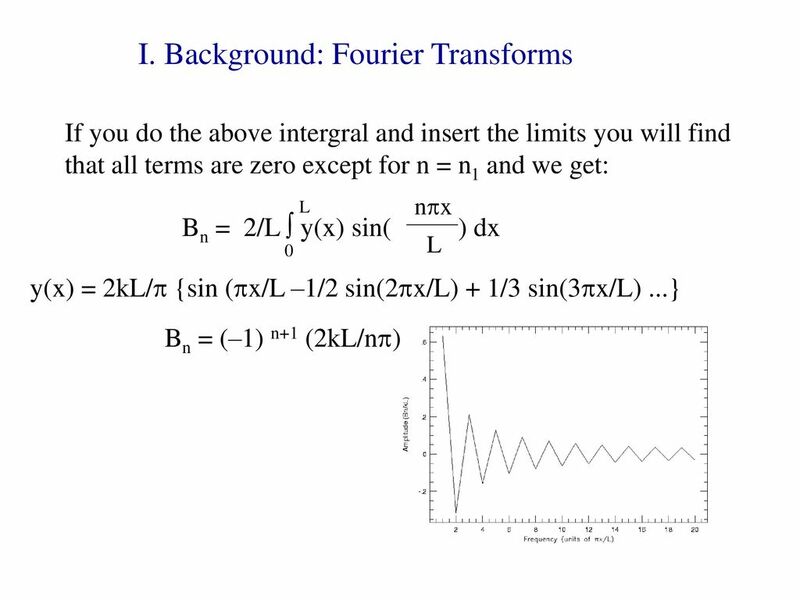 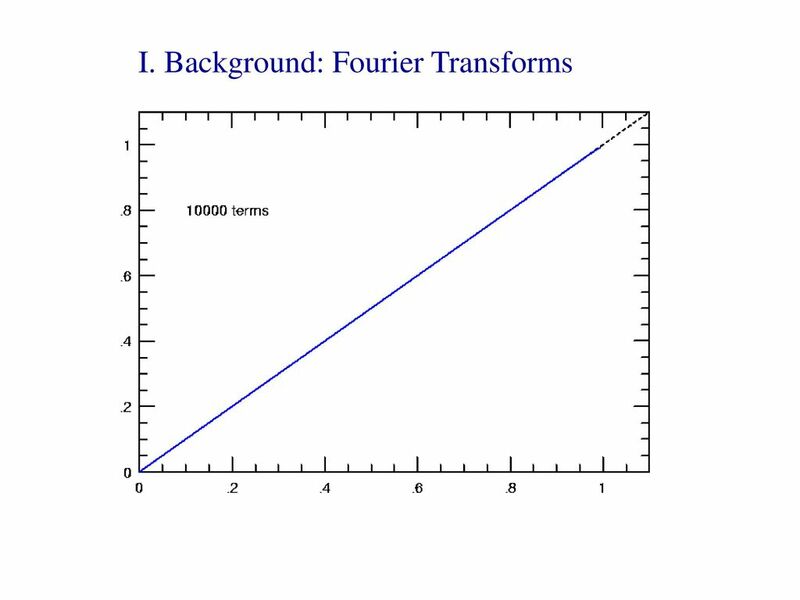 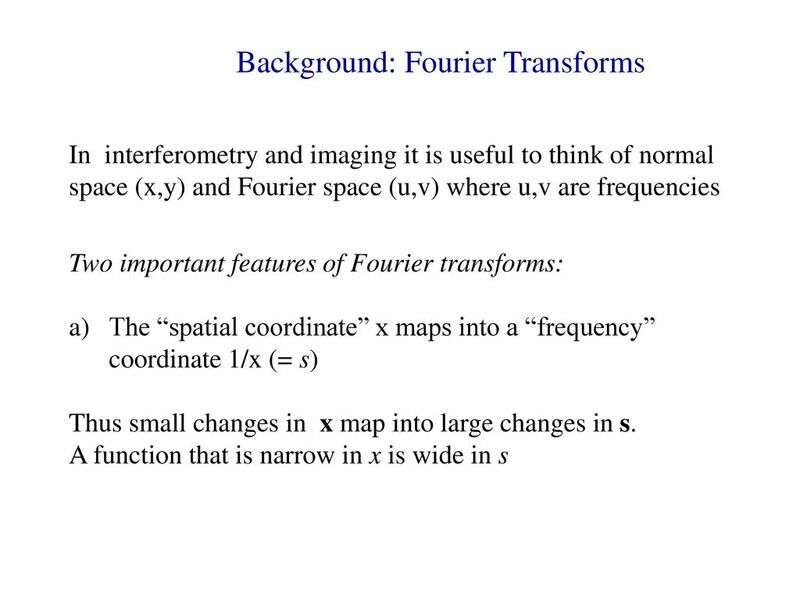 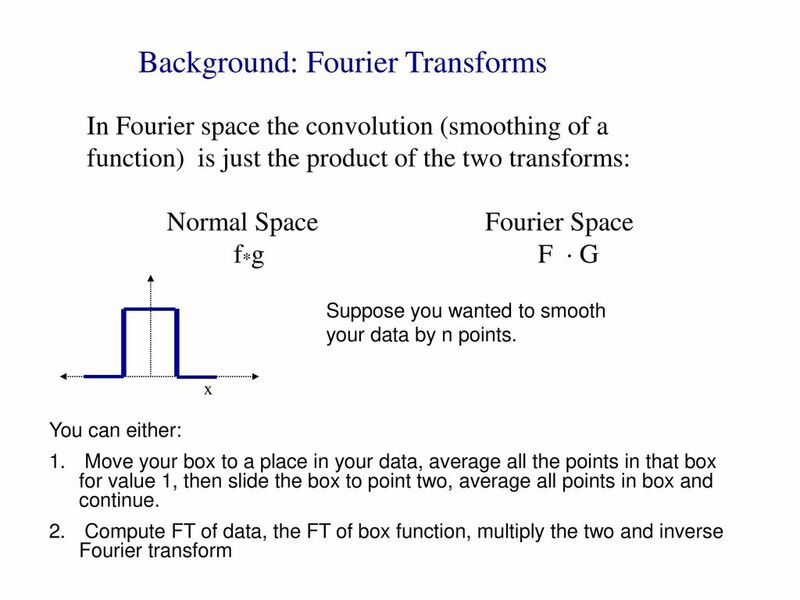 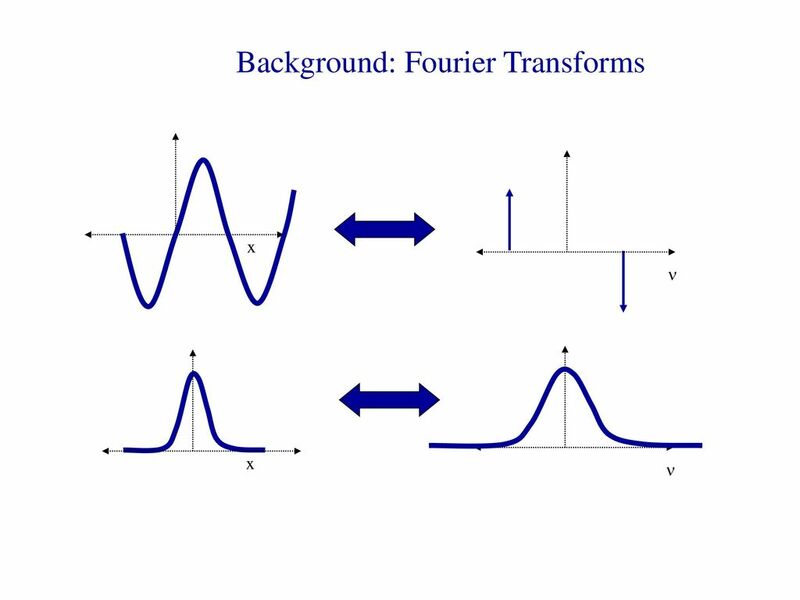 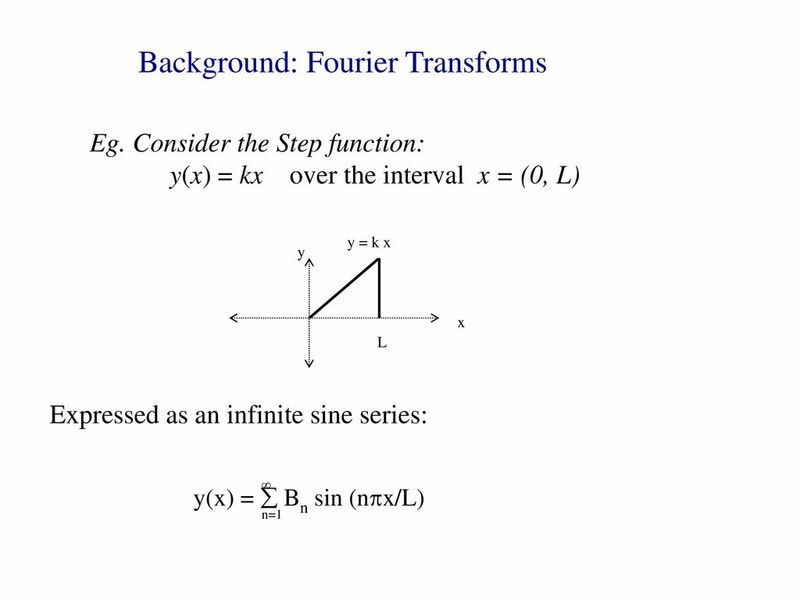 The square of the Fourier transform is the power spectra and is related to the intensity when dealing with light. 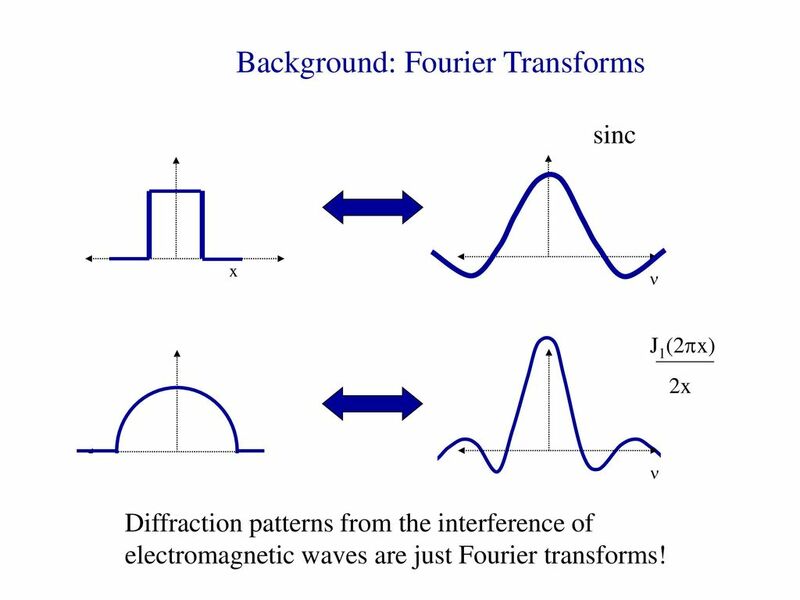 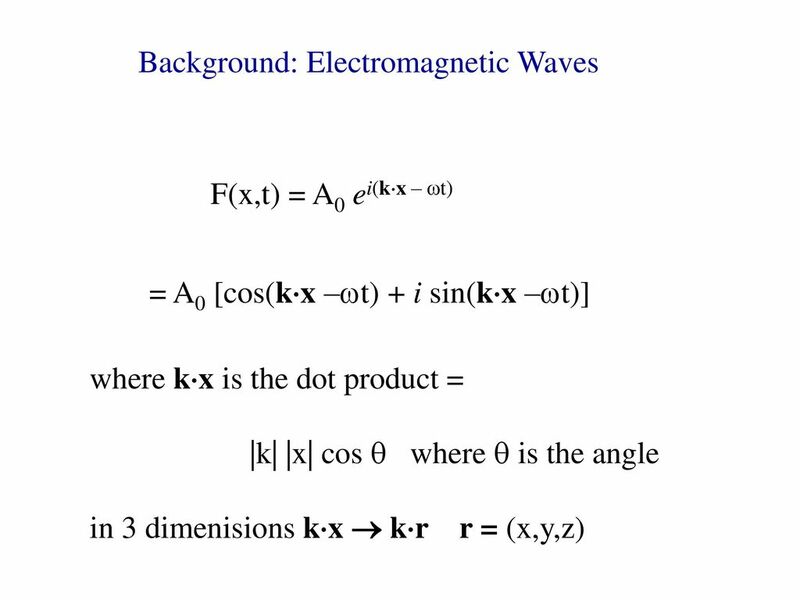 sinc x n J1(2px) 2x x Diffraction patterns from the interference of electromagnetic waves are just Fourier transforms! 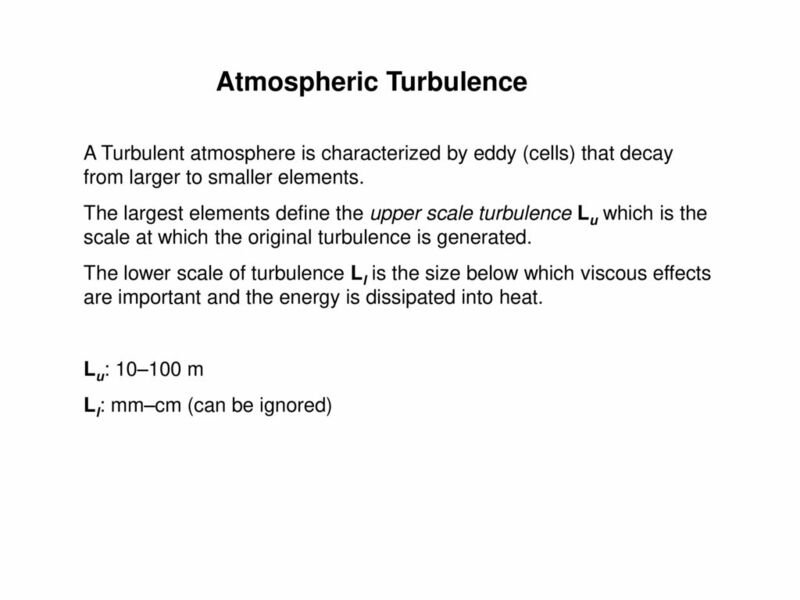 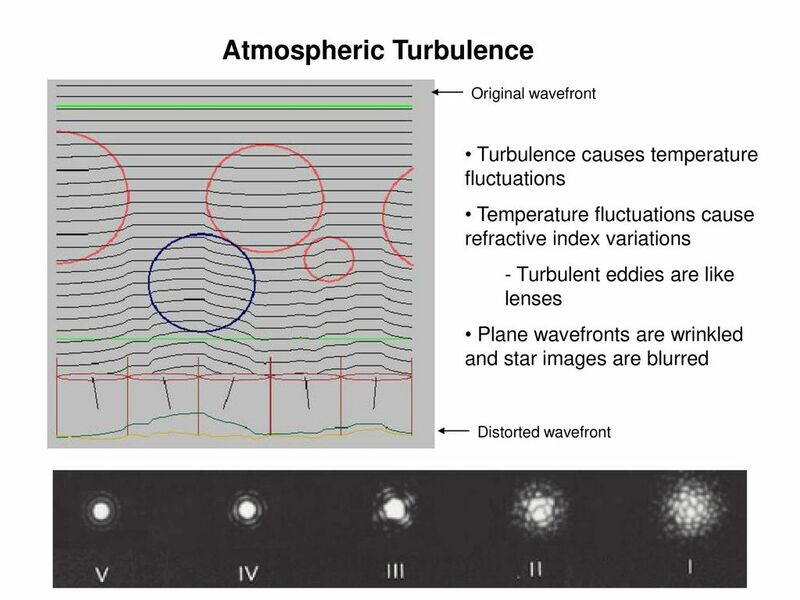 Atmospheric turbulence distorts stellar images making them much larger than point sources. 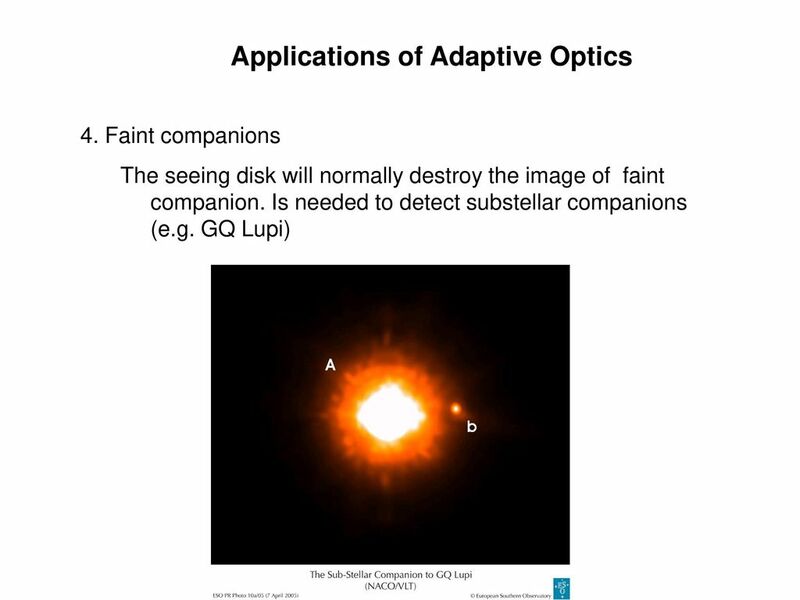 This seeing image makes it impossible to detect nearby faint companions. 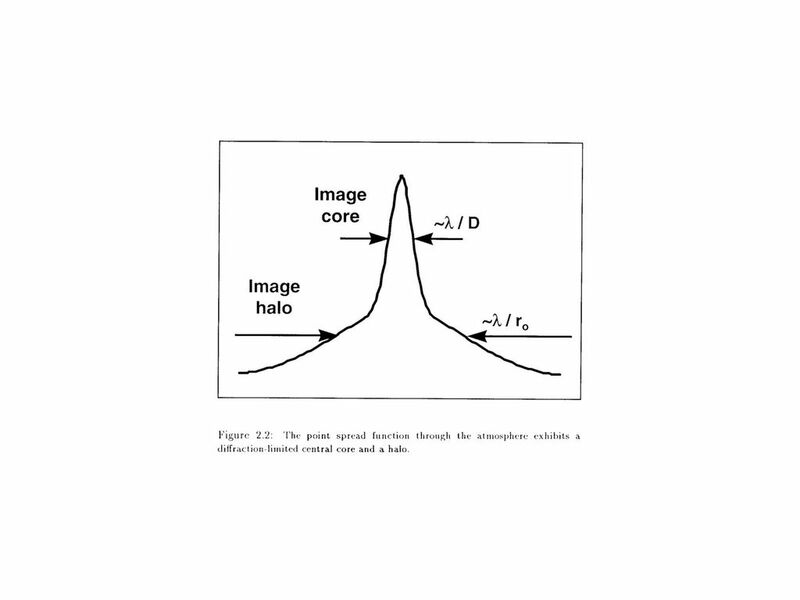 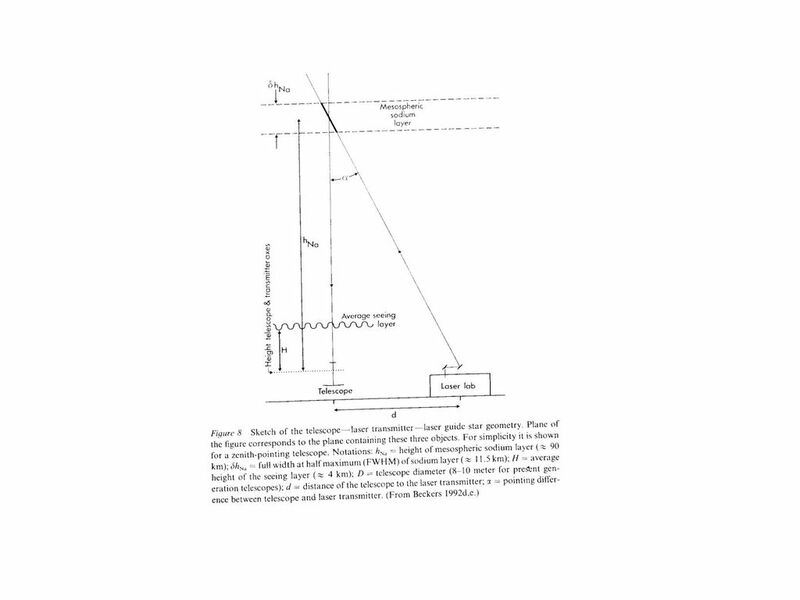 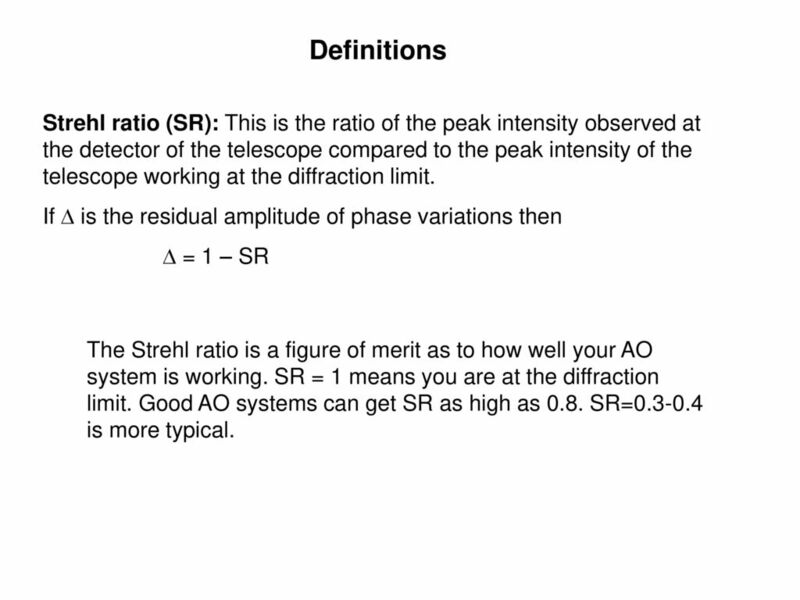 29 Definitions Strehl ratio (SR): This is the ratio of the peak intensity observed at the detector of the telescope compared to the peak intensity of the telescope working at the diffraction limit. 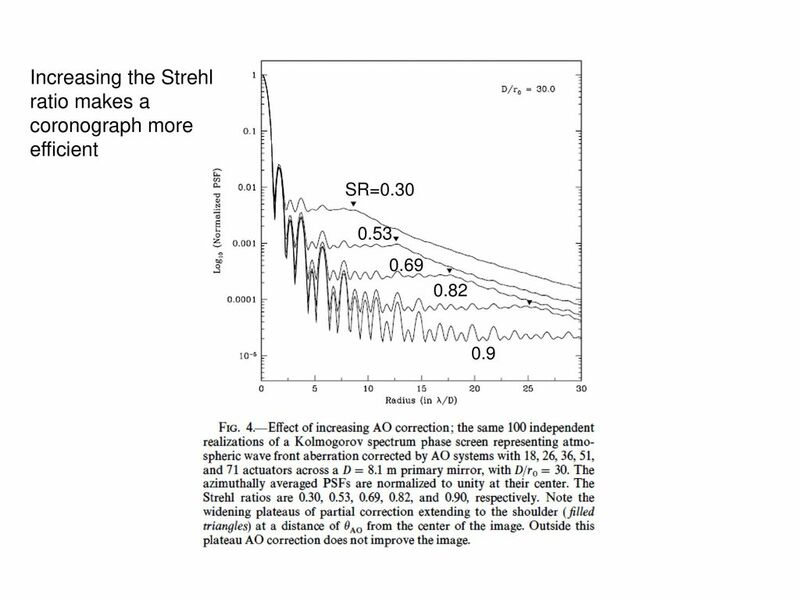 If D is the residual amplitude of phase variations then D = 1 – SR The Strehl ratio is a figure of merit as to how well your AO system is working. 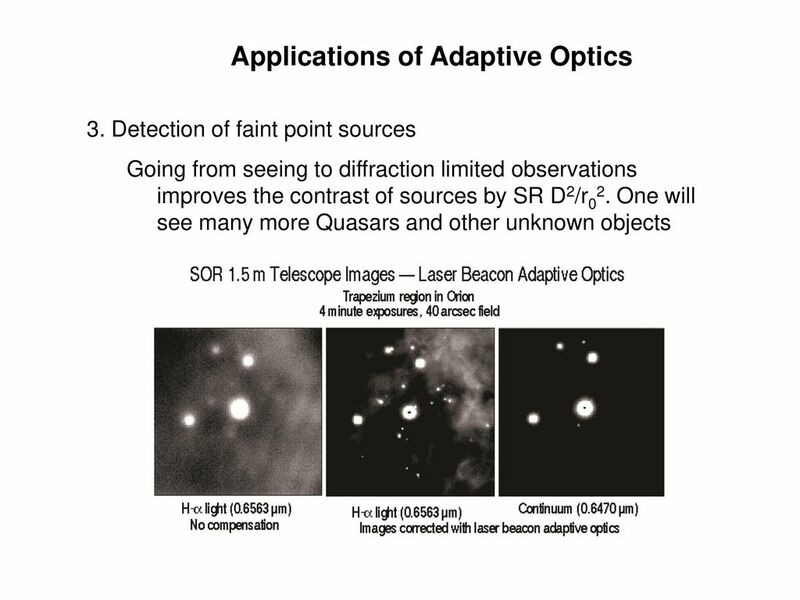 SR = 1 means you are at the diffraction limit. 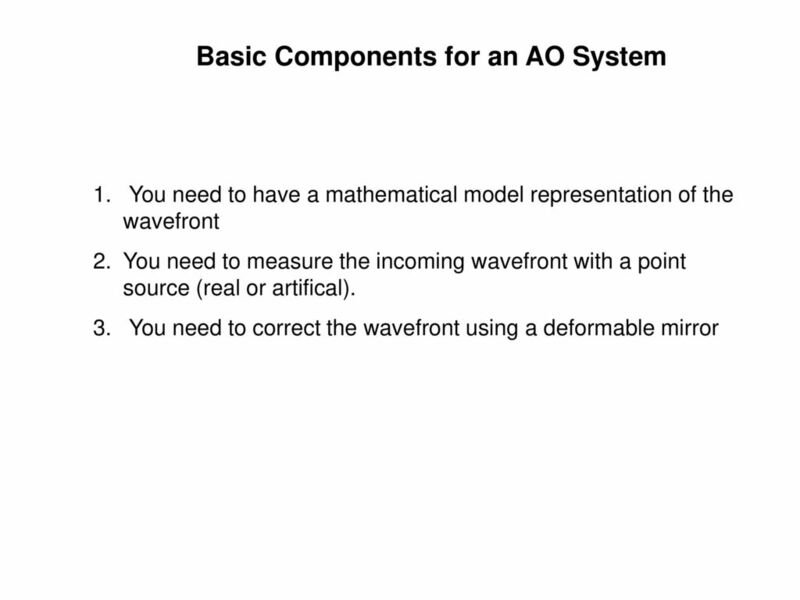 Good AO systems can get SR as high as 0.8. 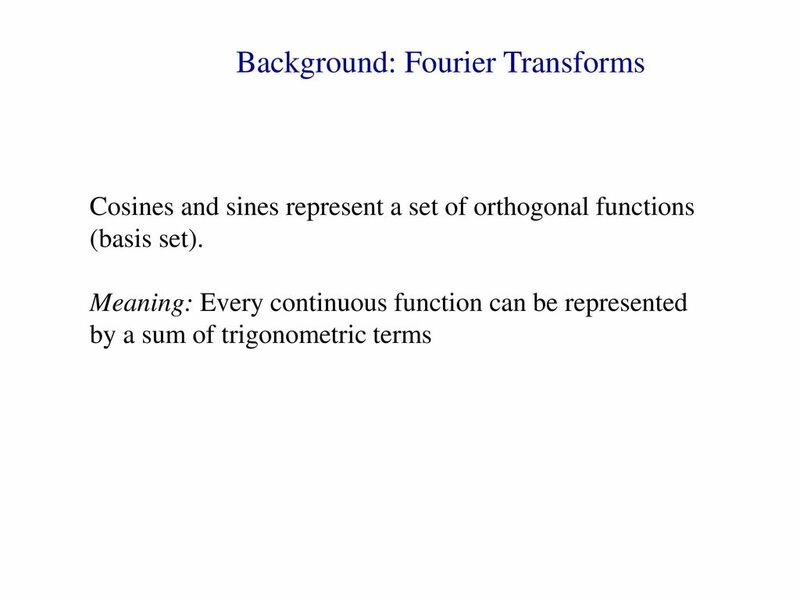 SR= is more typical. 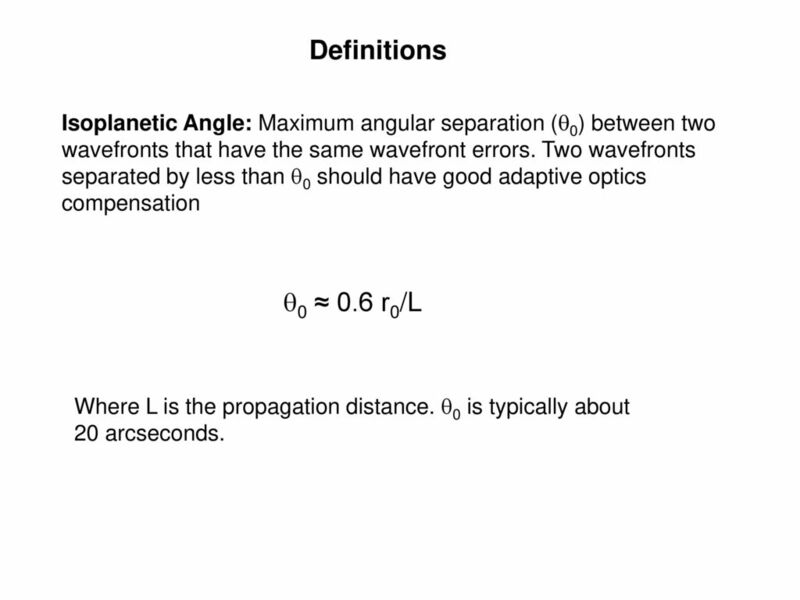 30 Definitions Isoplanetic Angle: Maximum angular separation (q0) between two wavefronts that have the same wavefront errors. 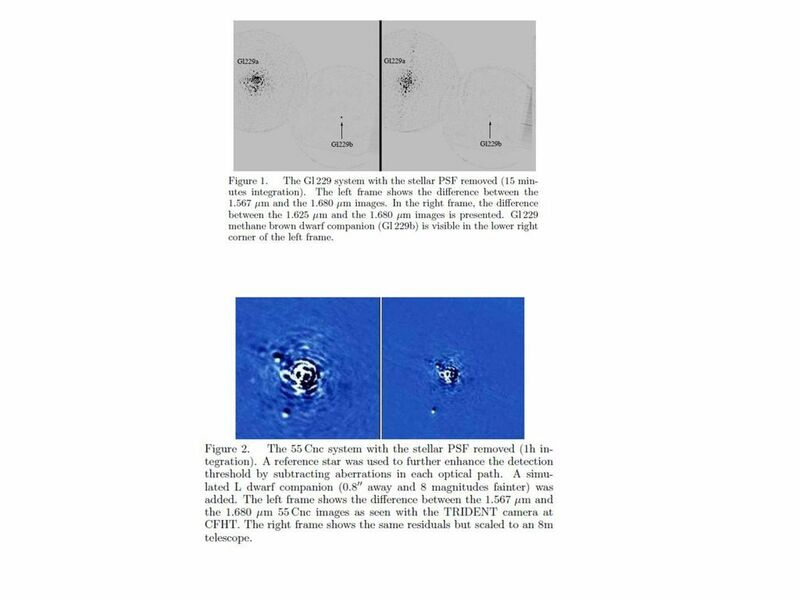 Two wavefronts separated by less than q0 should have good adaptive optics compensation q0 ≈ 0.6 r0/L Where L is the propagation distance. 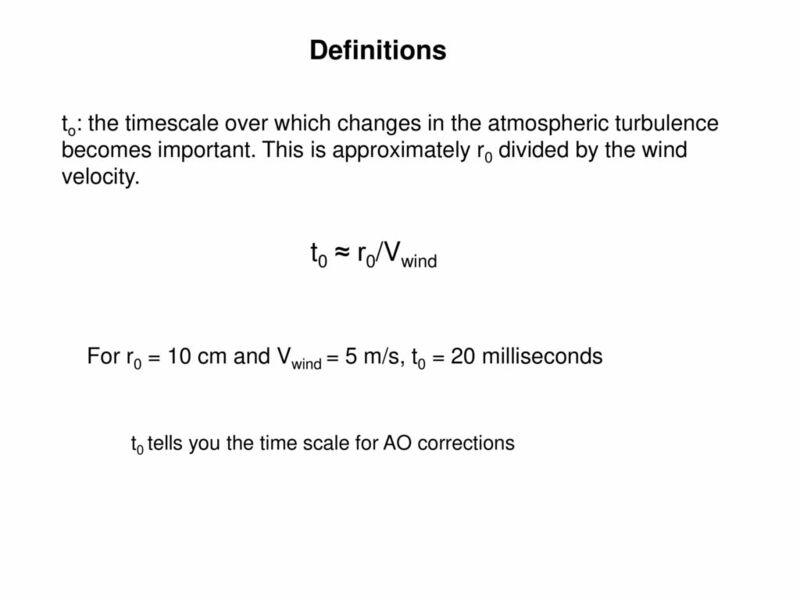 q0 is typically about 20 arcseconds. 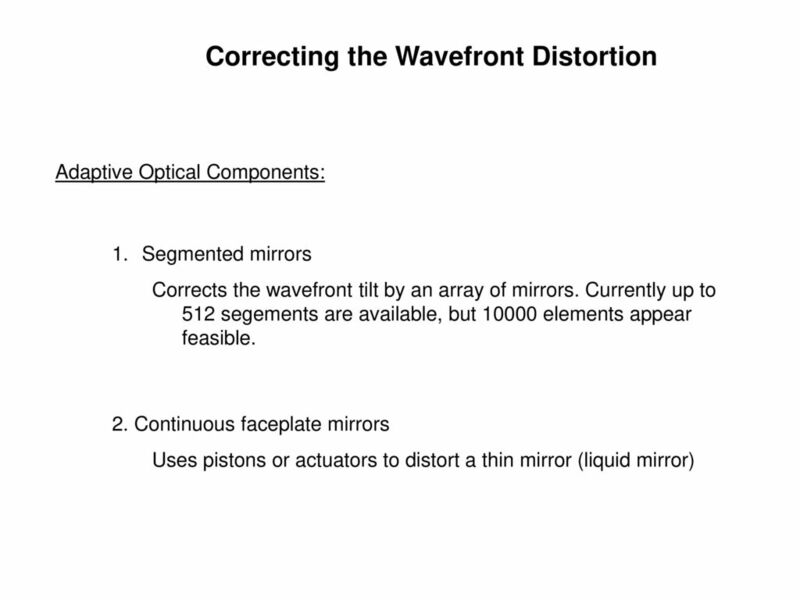 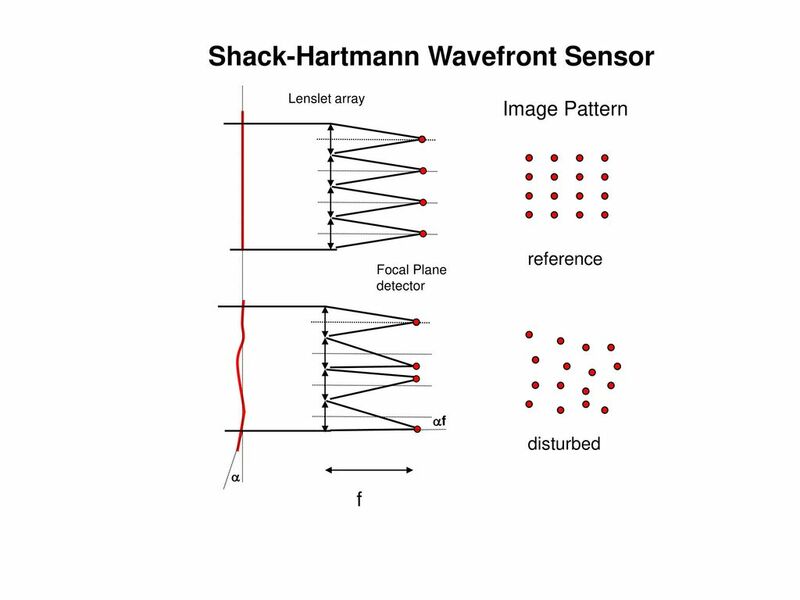 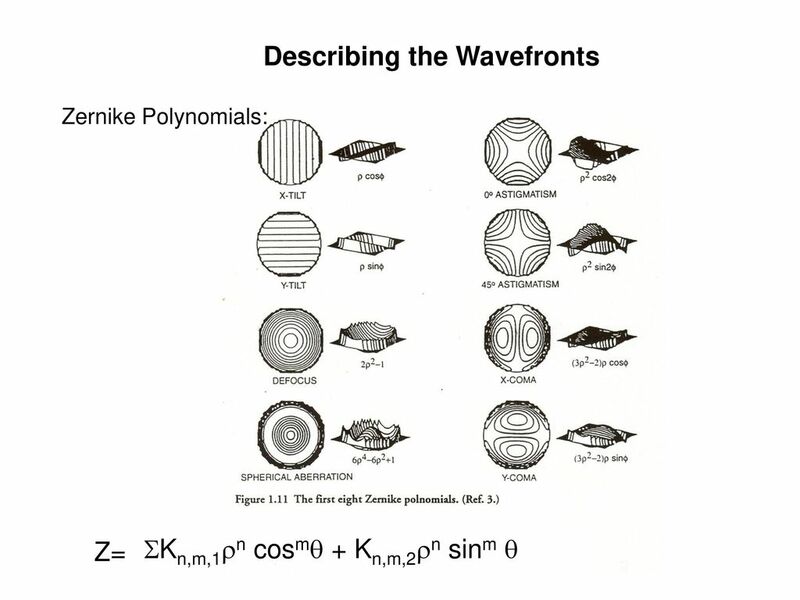 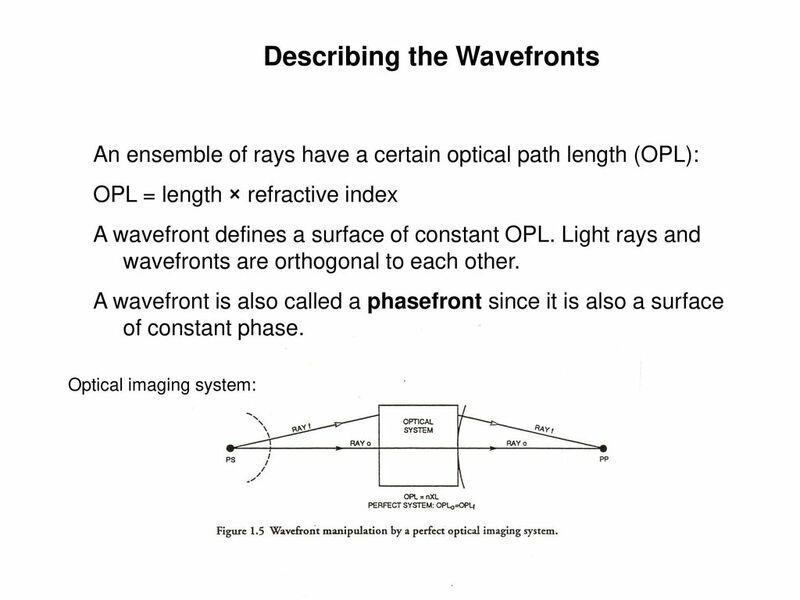 The aberrated wavefront is compared to an ideal spherical wavefront called a the reference wavefront. 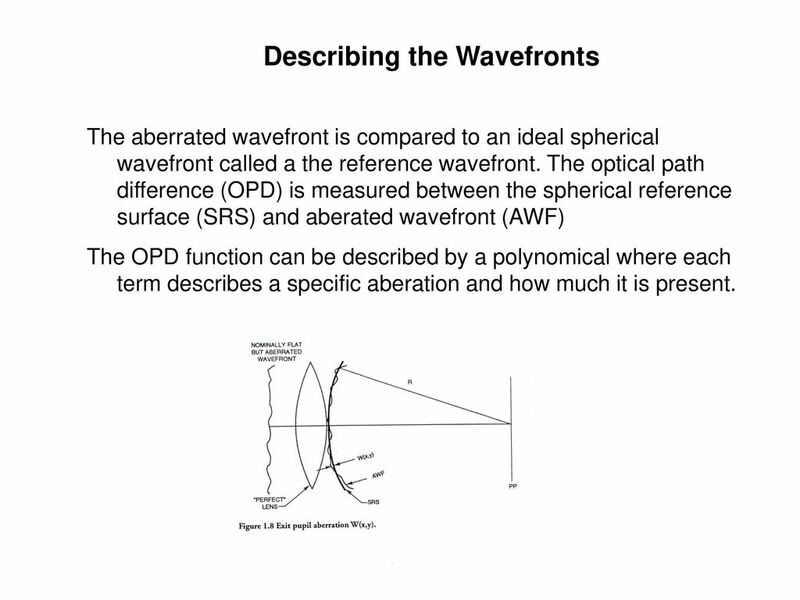 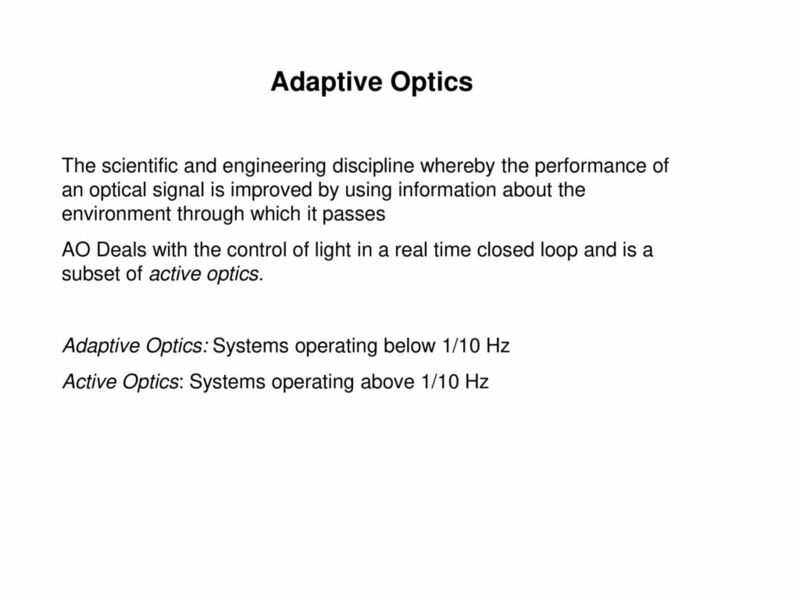 The optical path difference (OPD) is measured between the spherical reference surface (SRS) and aberated wavefront (AWF) The OPD function can be described by a polynomical where each term describes a specific aberation and how much it is present. 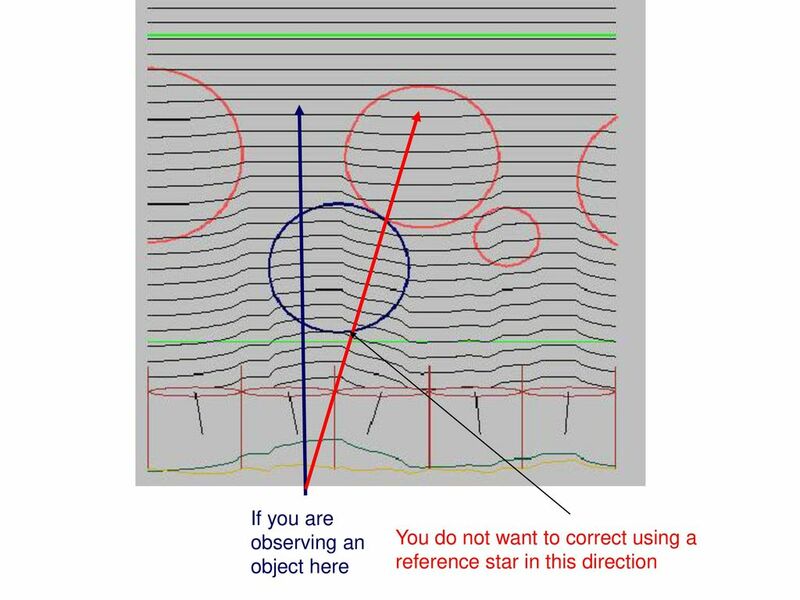 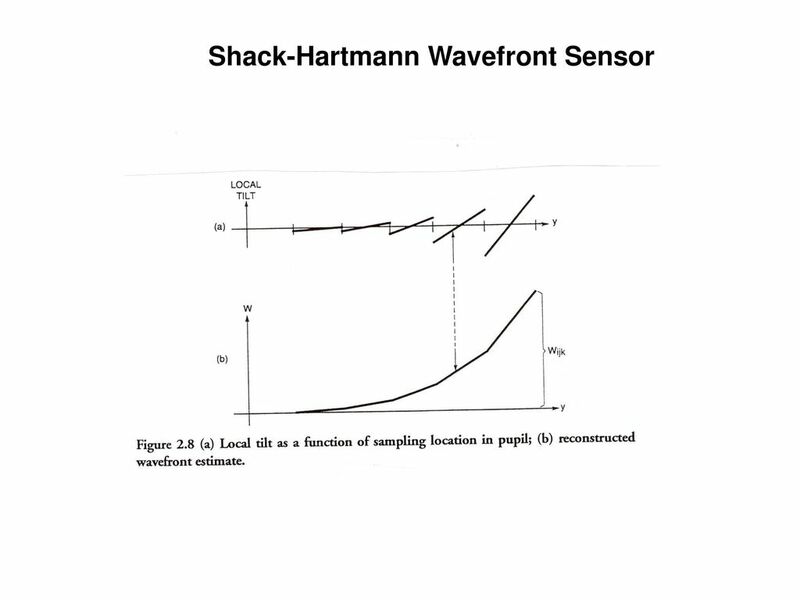 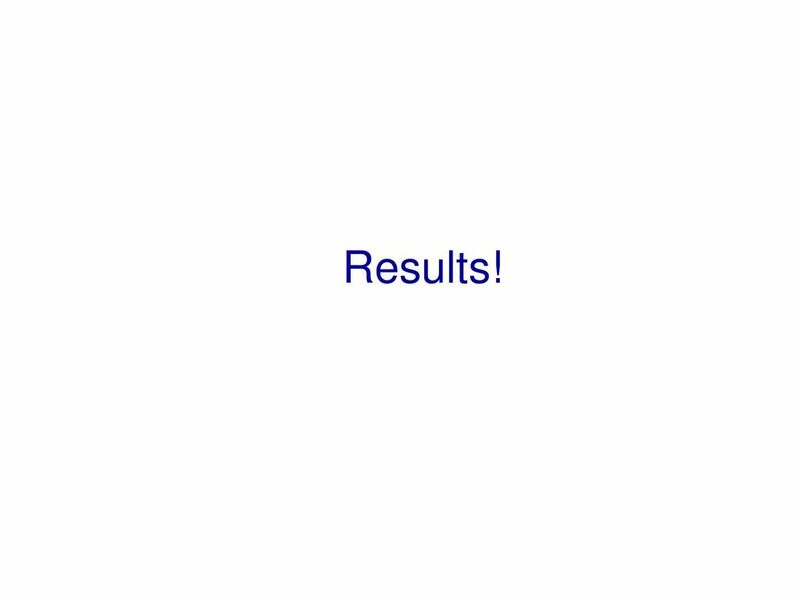 44 Reference Stars You need a reference point source (star) for the wavefront measurement. 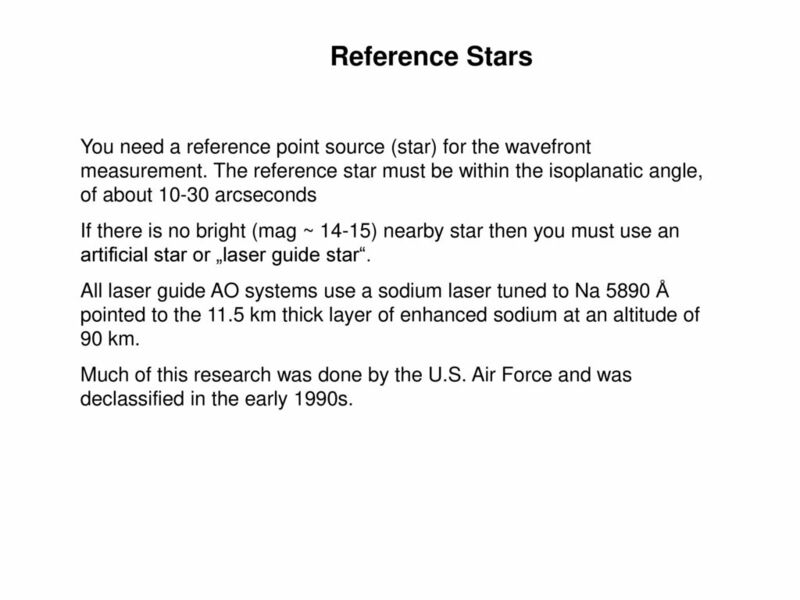 The reference star must be within the isoplanatic angle, of about arcseconds If there is no bright (mag ~ 14-15) nearby star then you must use an artificial star or „laser guide star“. 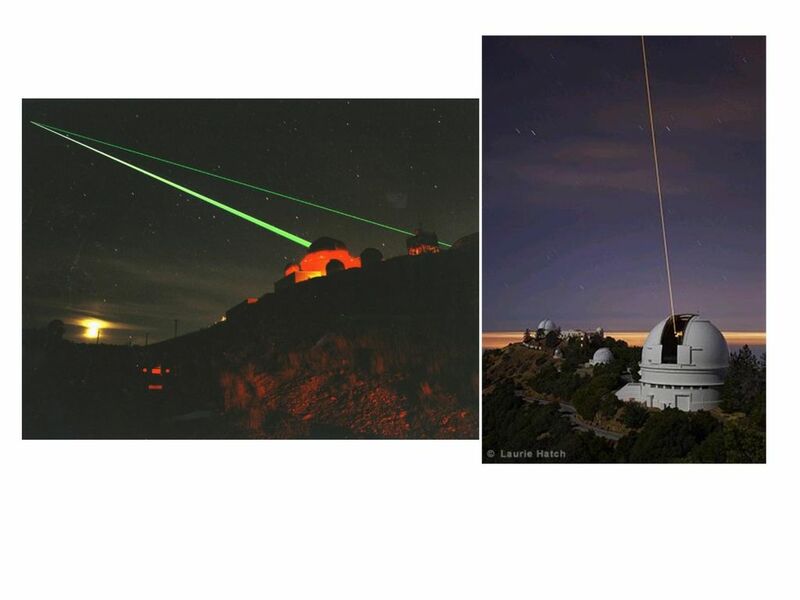 All laser guide AO systems use a sodium laser tuned to Na 5890 Å pointed to the 11.5 km thick layer of enhanced sodium at an altitude of 90 km. 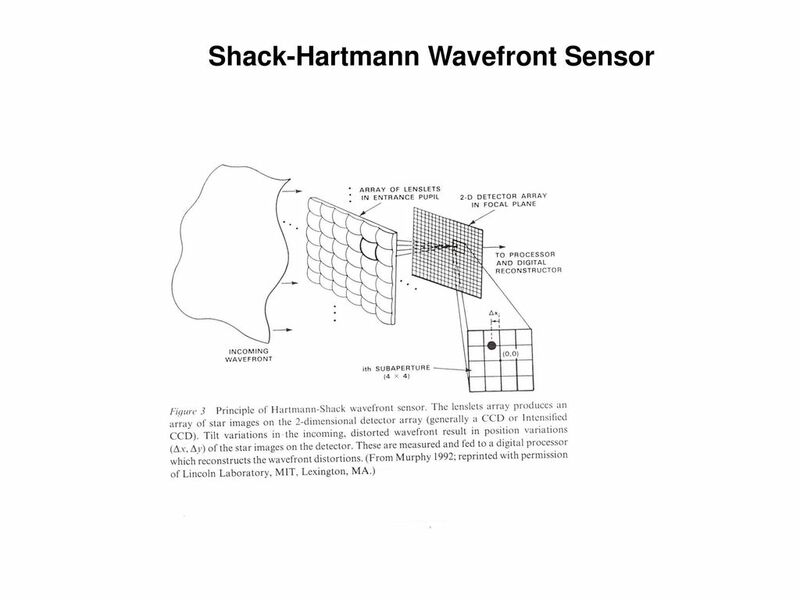 Much of this research was done by the U.S. Air Force and was declassified in the early 1990s. 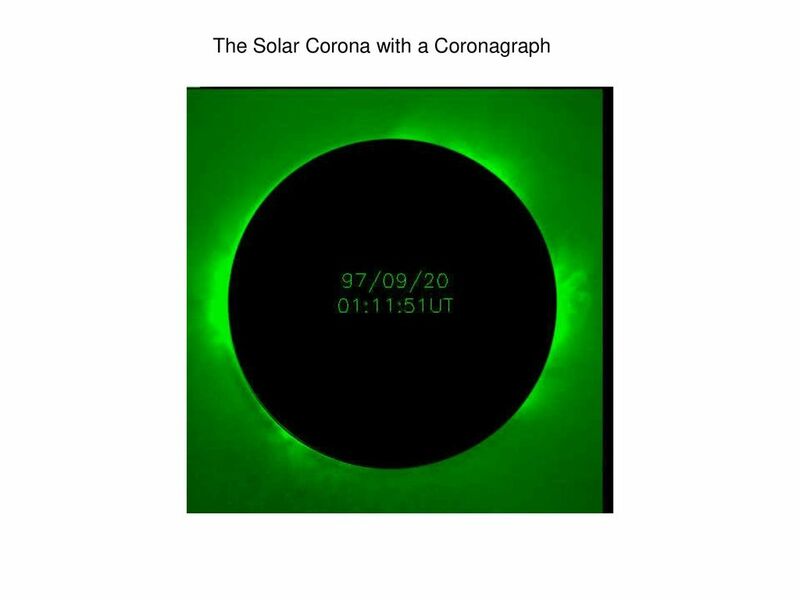 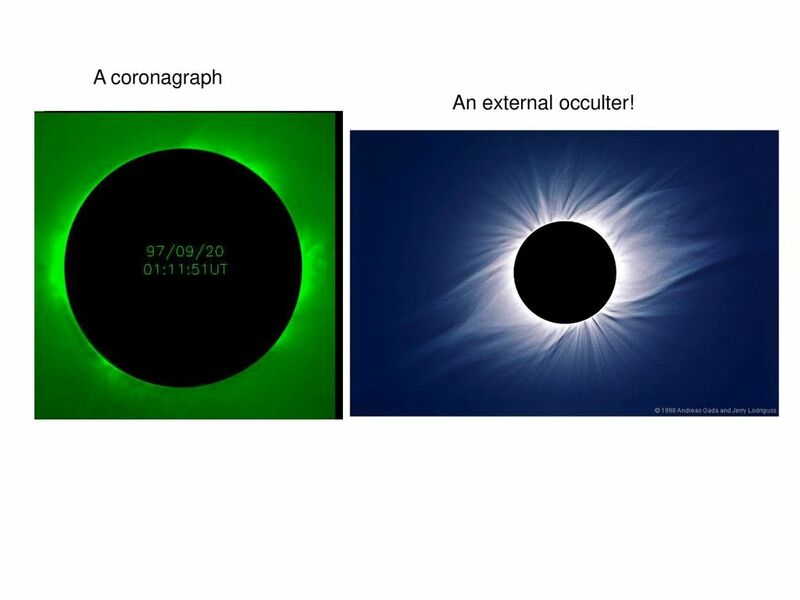 72 A coronagraph An external occulter! 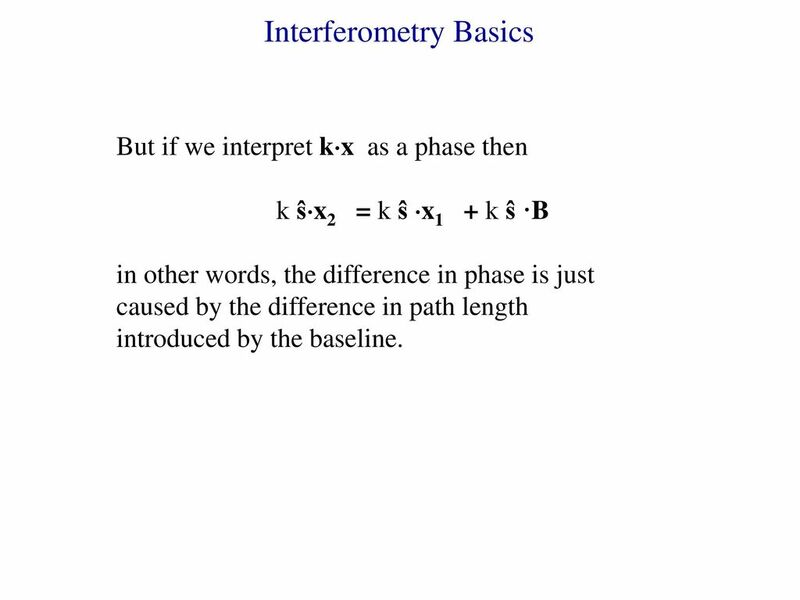 But if we interpret kx as a phase then k ŝx2 = k ŝ x1 + k ŝ ·B in other words, the difference in phase is just caused by the difference in path length introduced by the baseline. 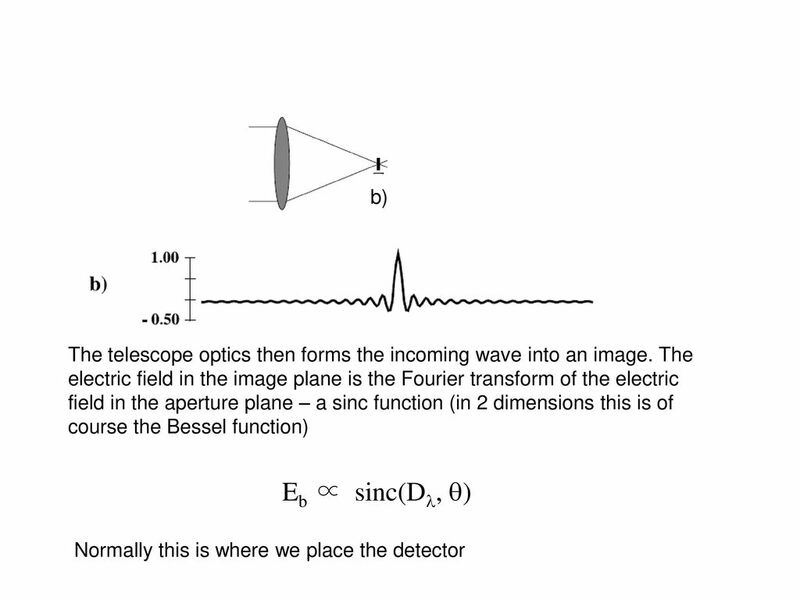 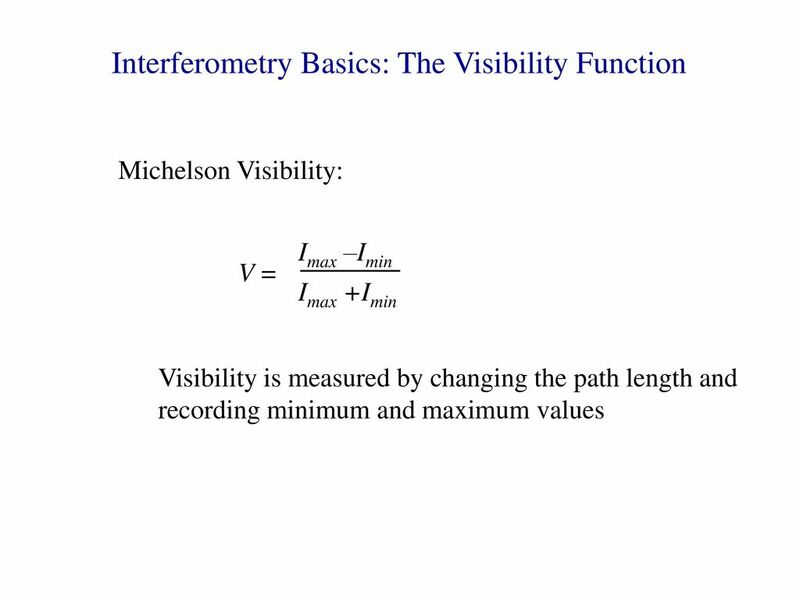 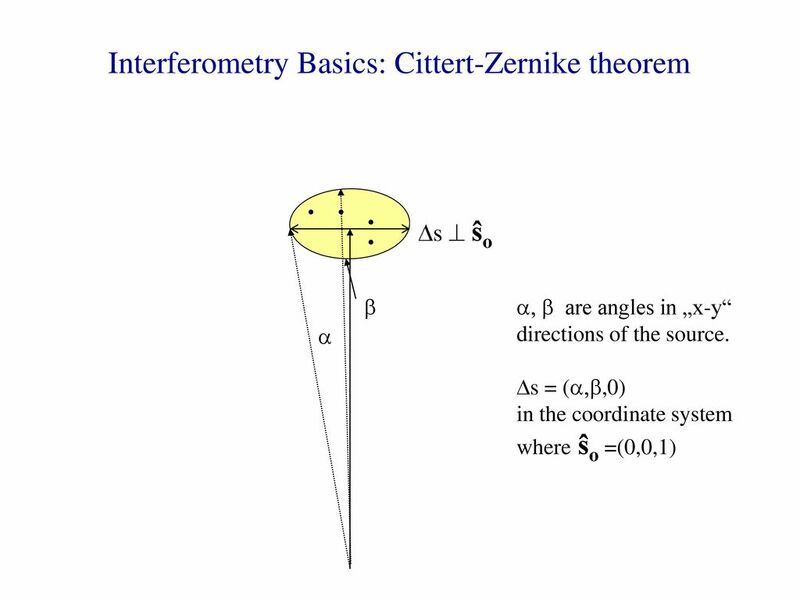 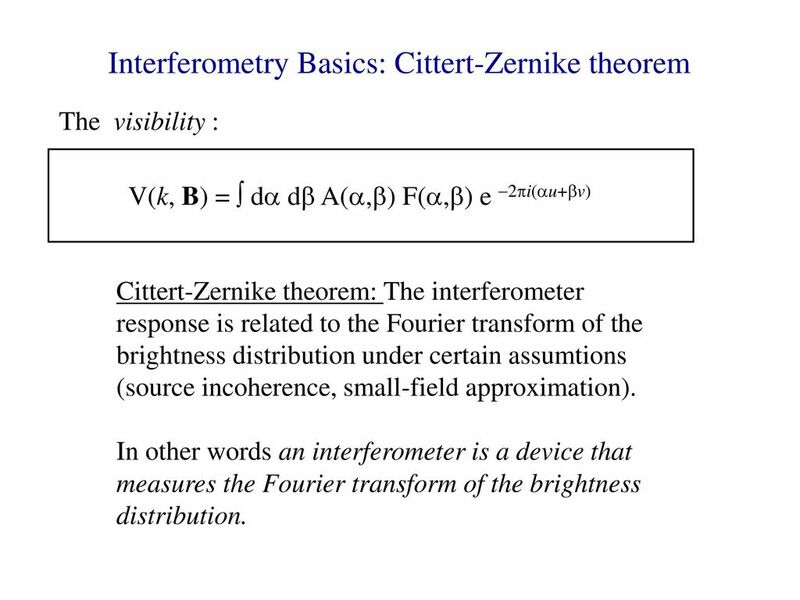 The visibility : V(k, B) =  da db A(a,b) F(a,b) e 2pi(au+bv) Cittert-Zernike theorem: The interferometer response is related to the Fourier transform of the brightness distribution under certain assumtions (source incoherence, small-field approximation). 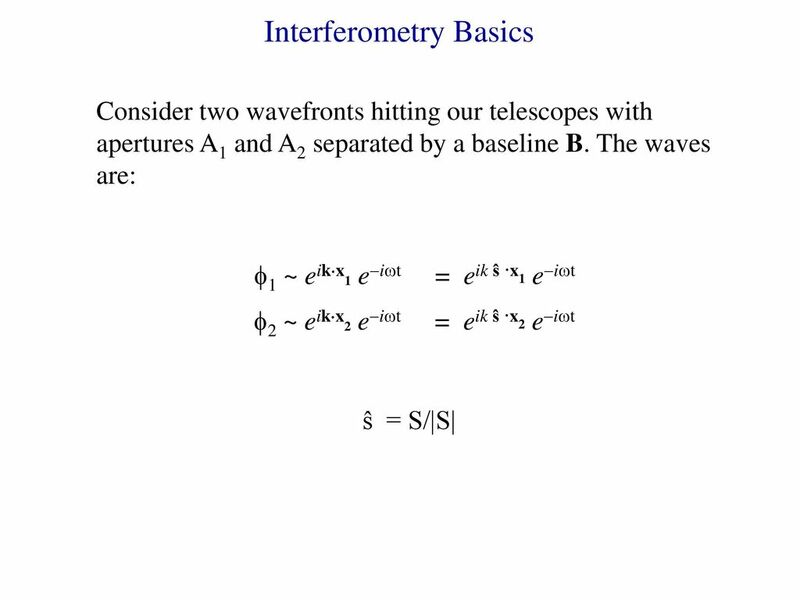 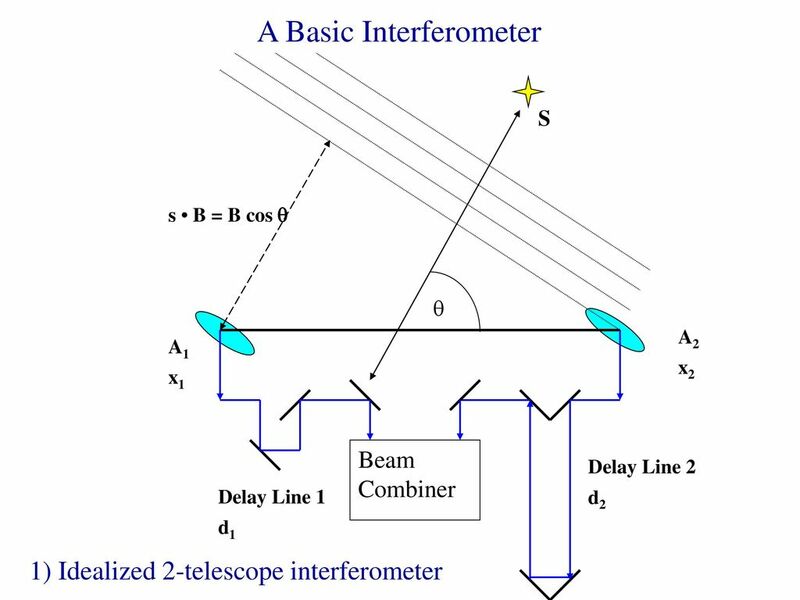 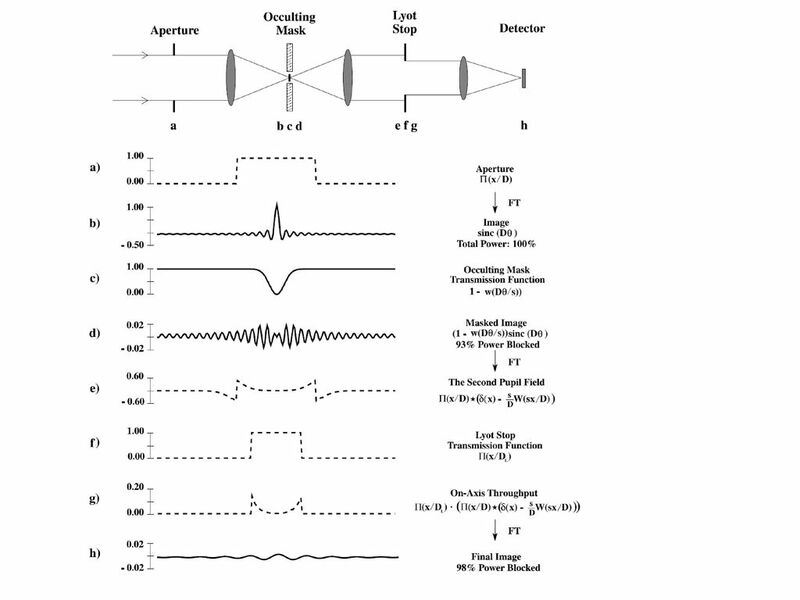 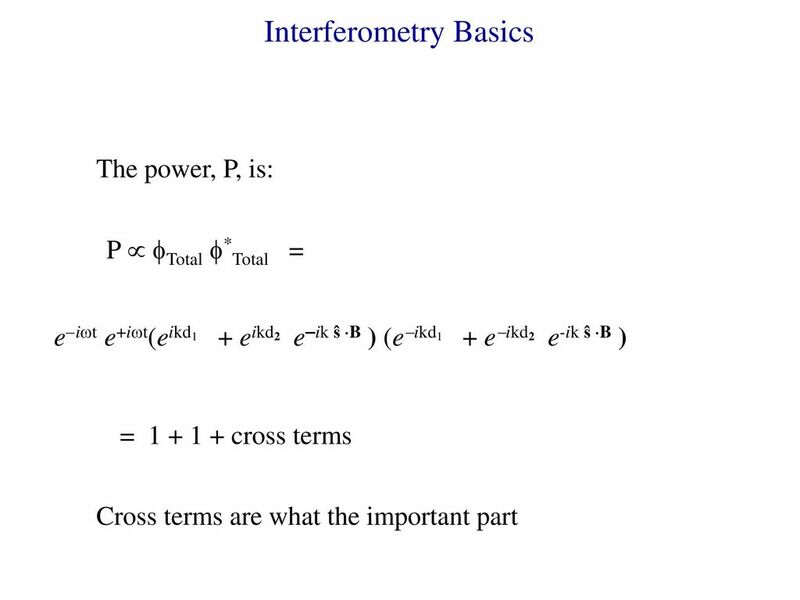 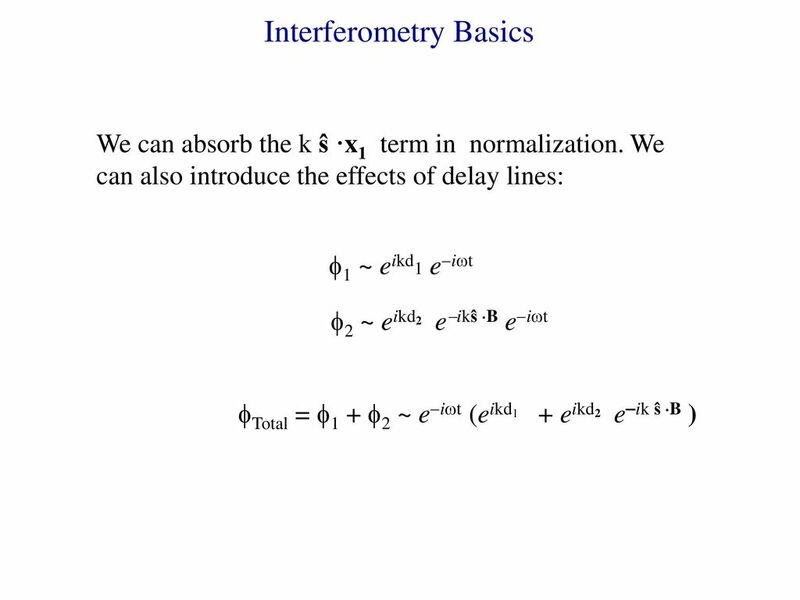 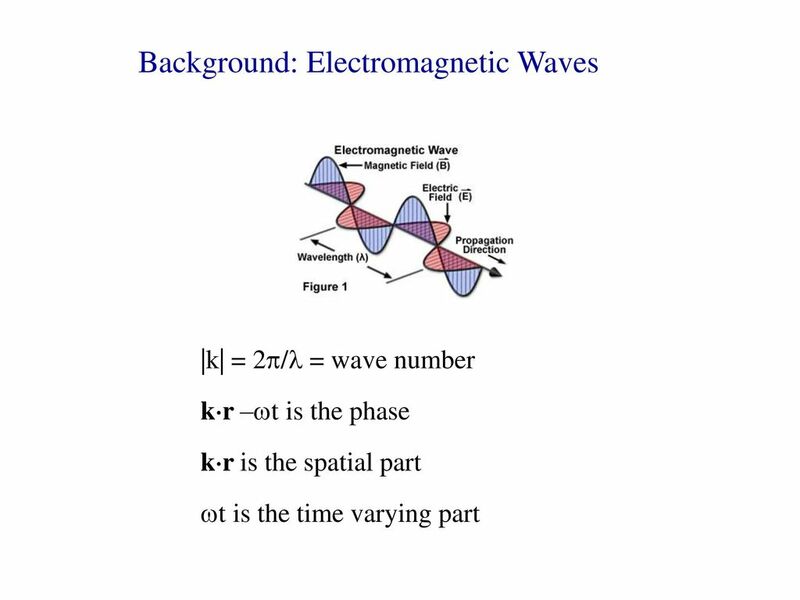 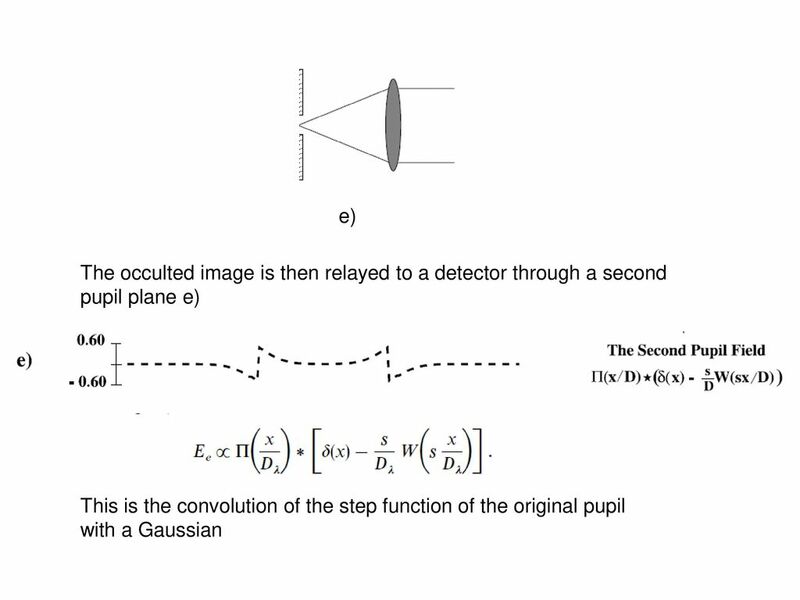 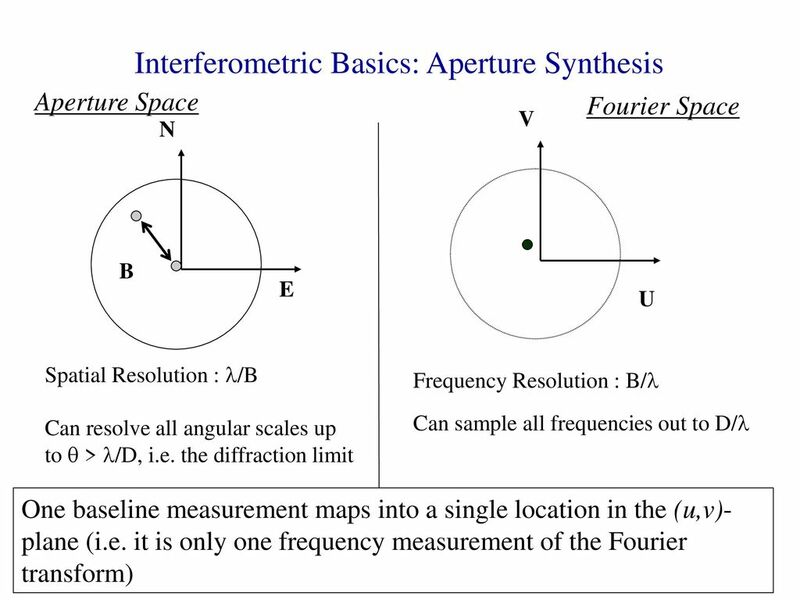 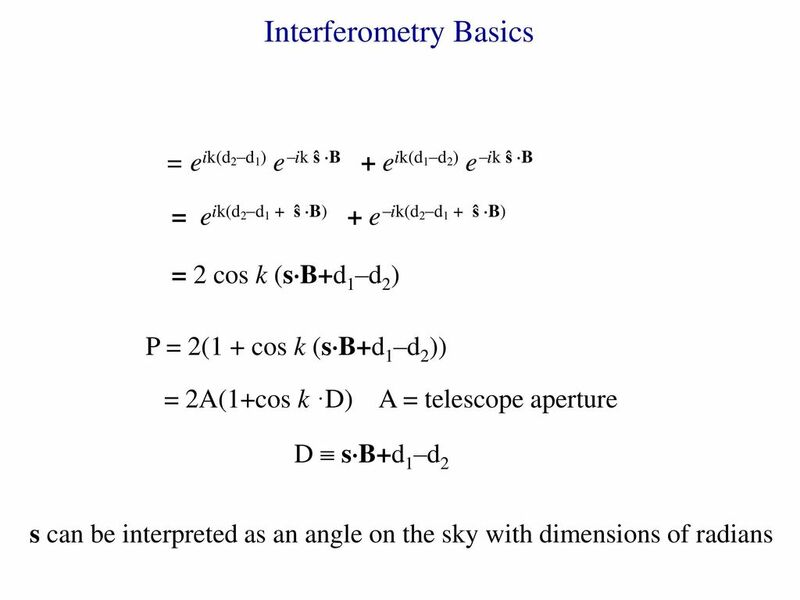 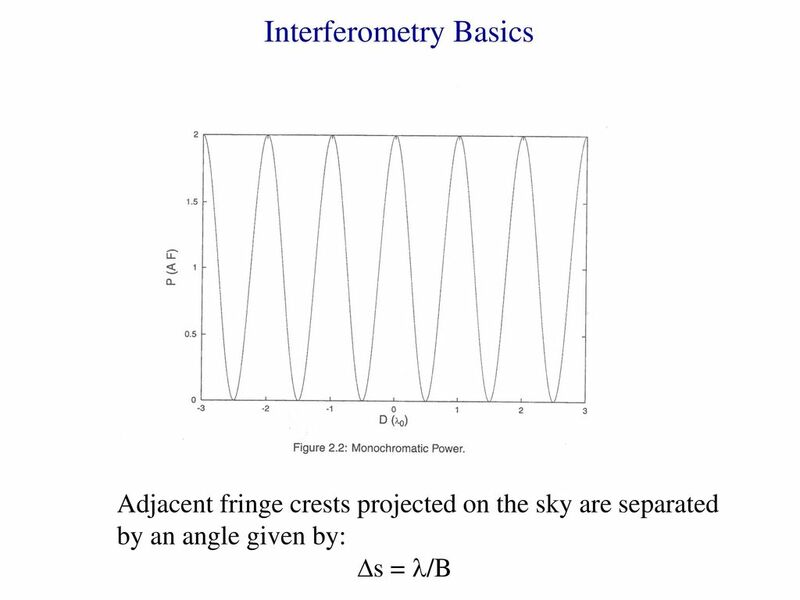 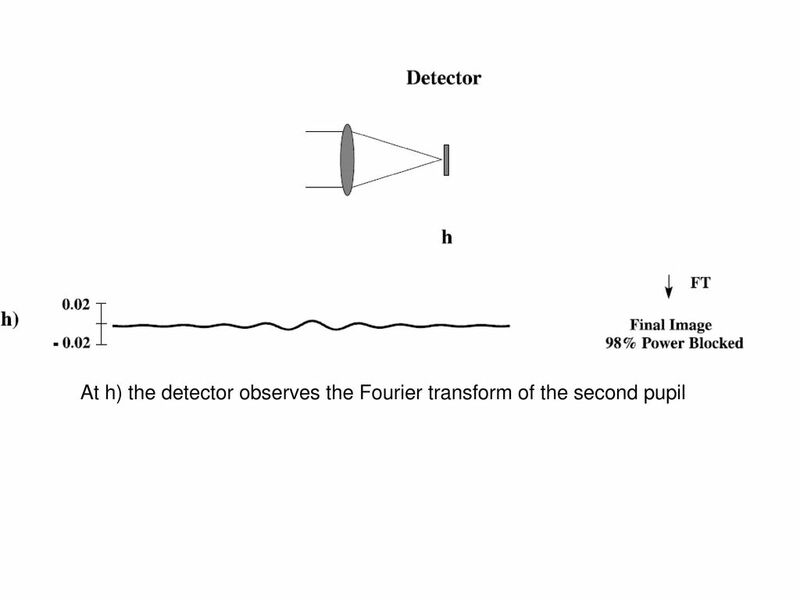 In other words an interferometer is a device that measures the Fourier transform of the brightness distribution. 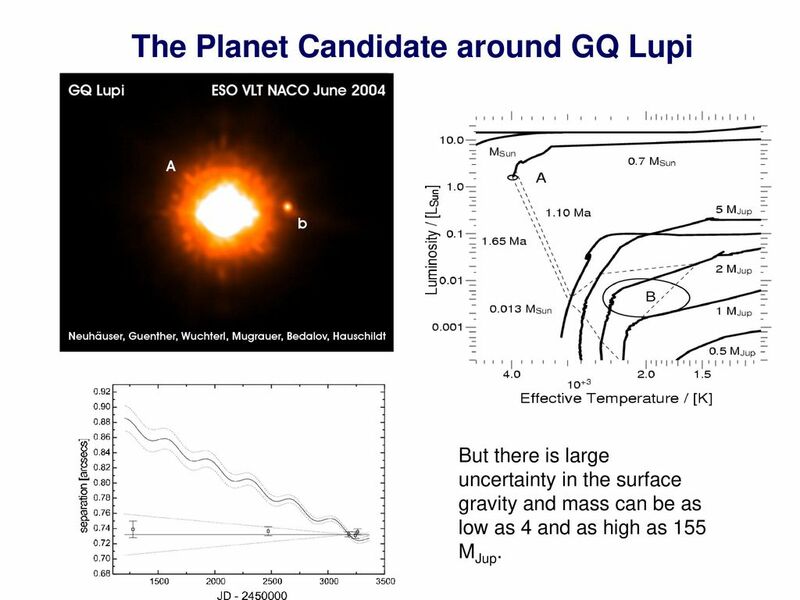 But there is large uncertainty in the surface gravity and mass can be as low as 4 and as high as 155 MJup. 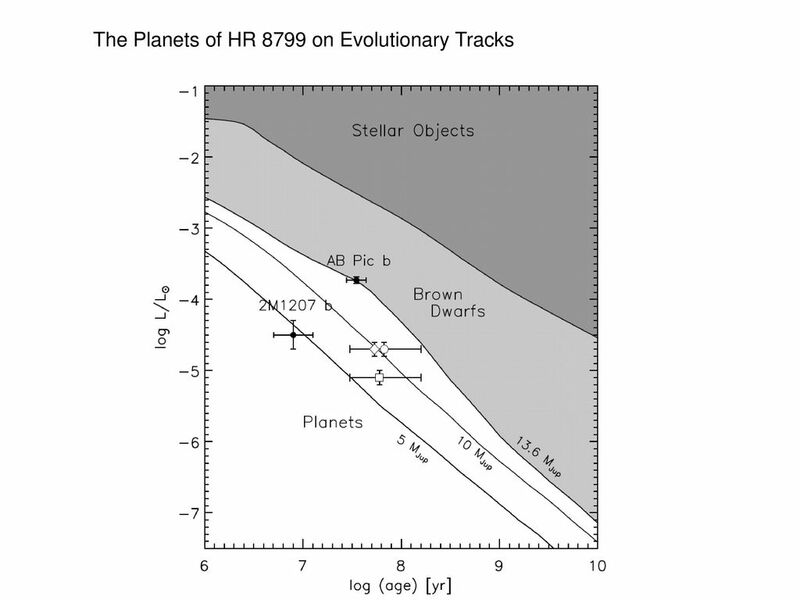 Planet model with T = 400 K and R = 1.2 RJup. 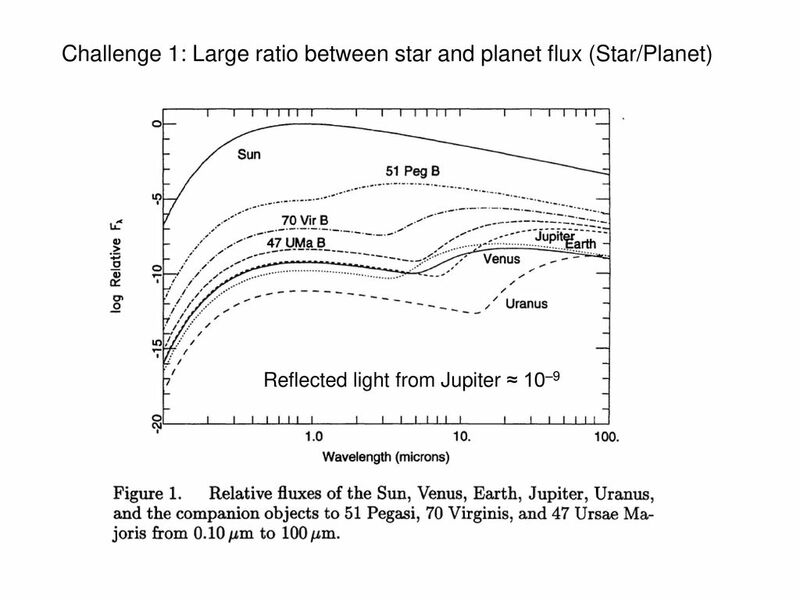 Reflected light from circumplanetary disk with R = 20 RJup Detection of the planet in the optical may be due to a disk around the planet. 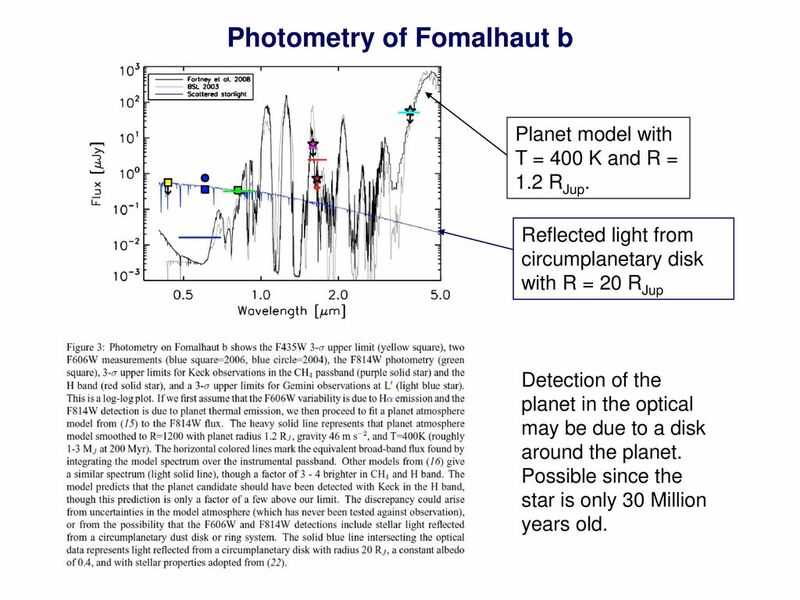 Possible since the star is only 30 Million years old. 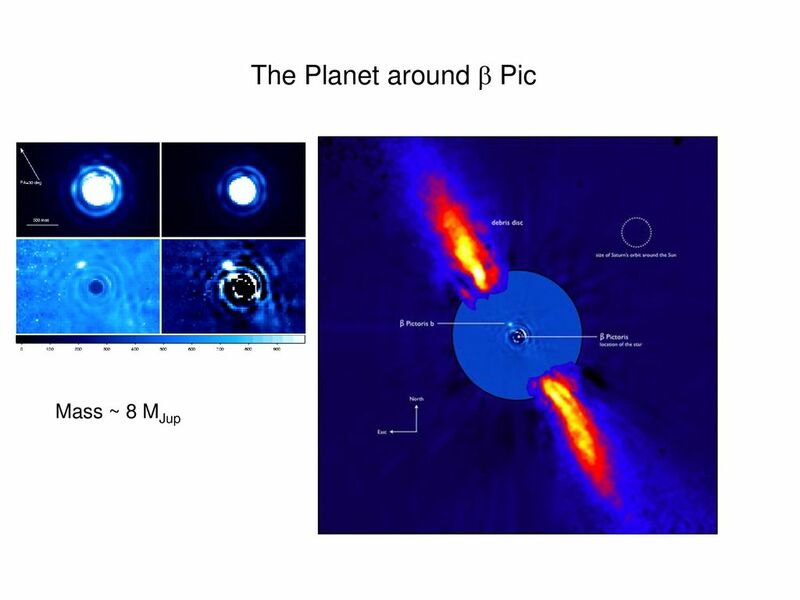 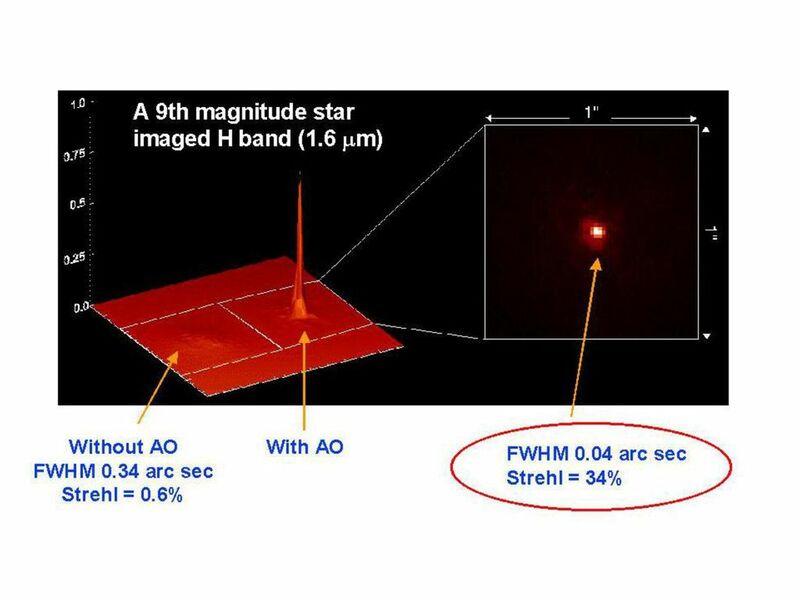 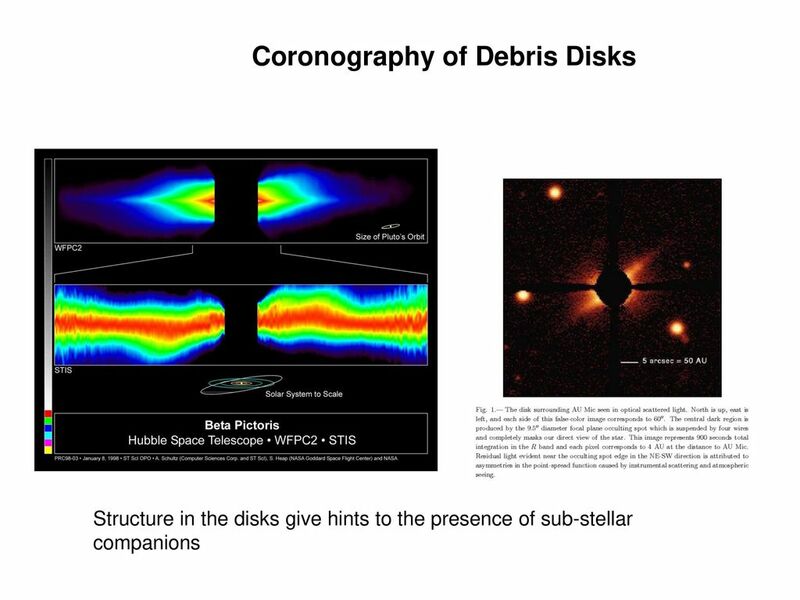 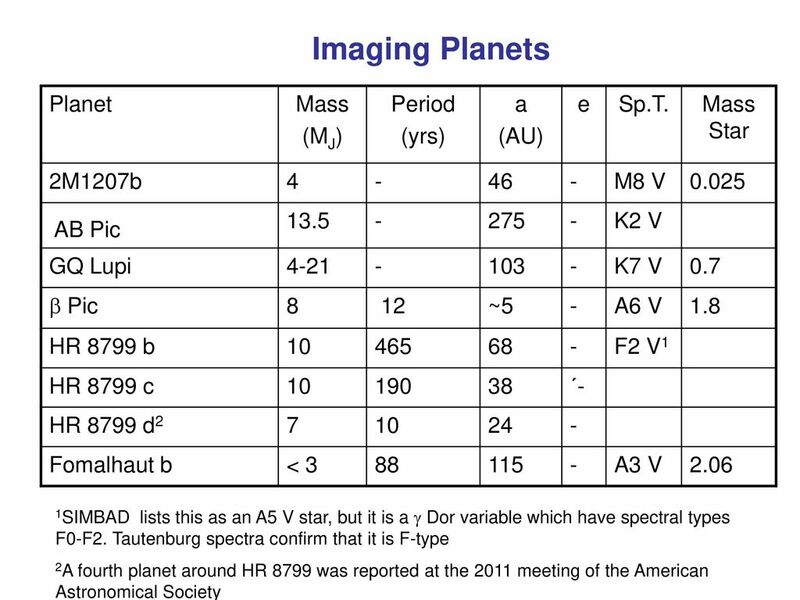 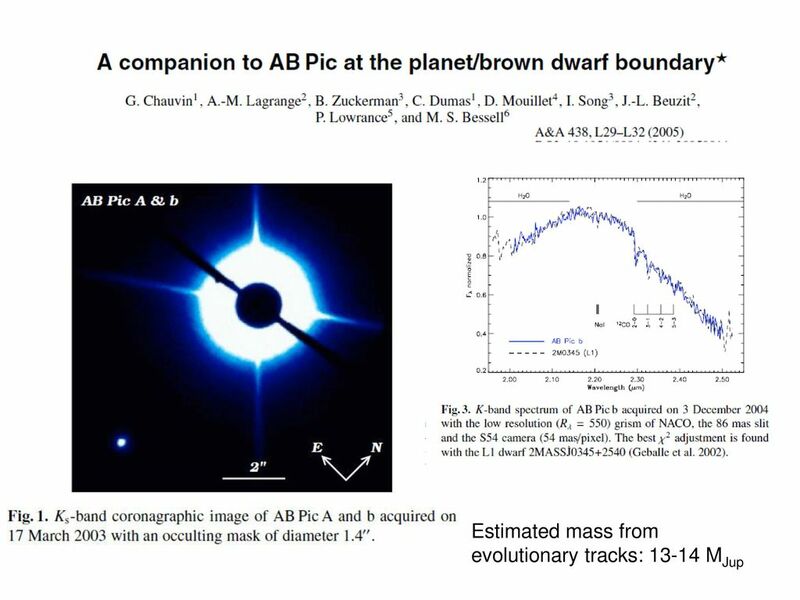 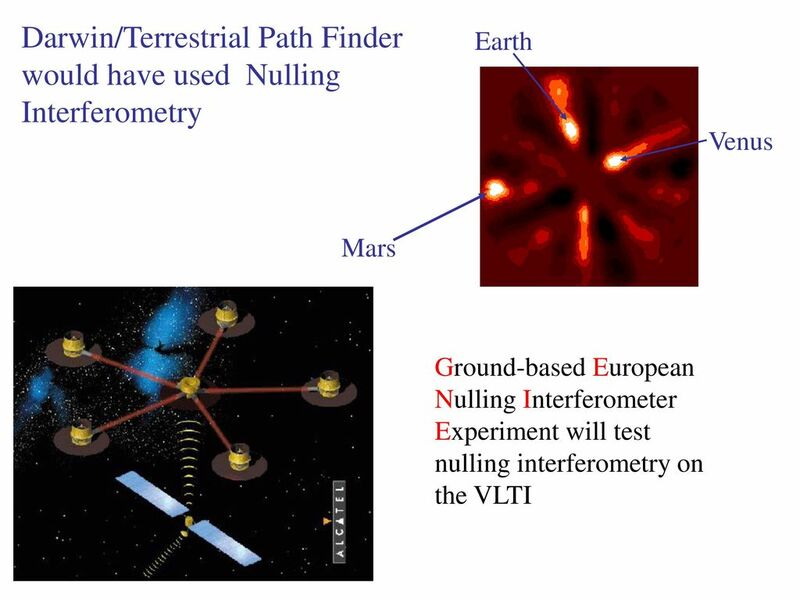 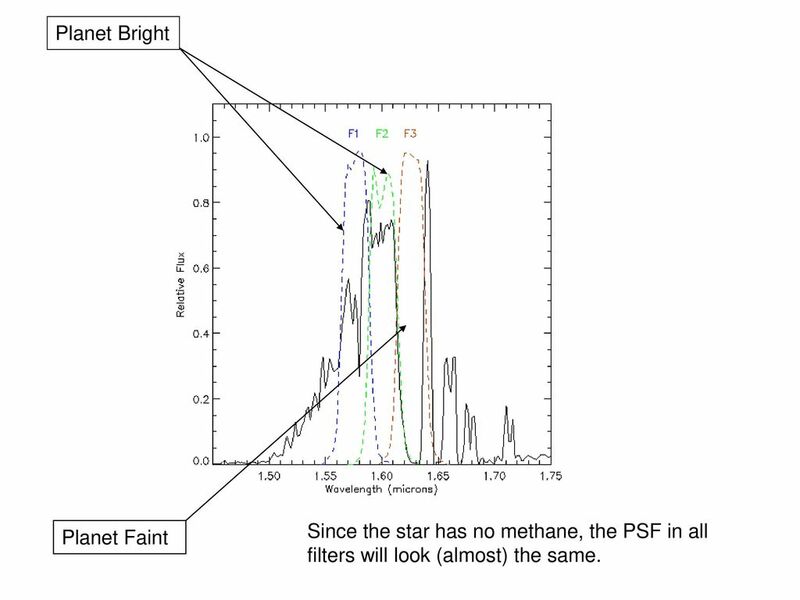 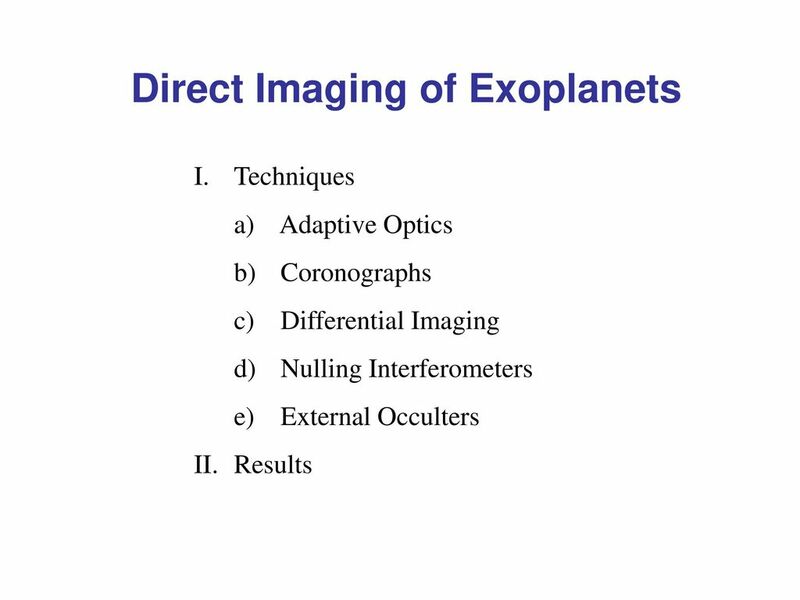 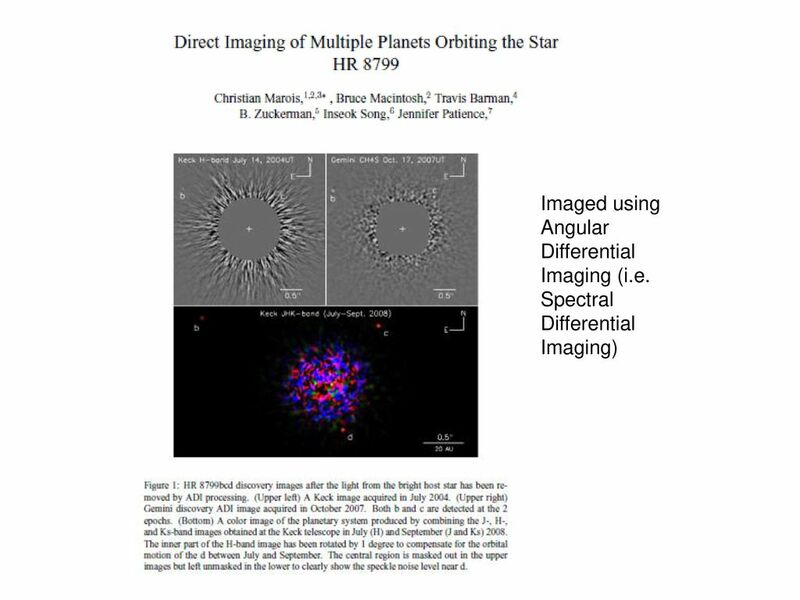 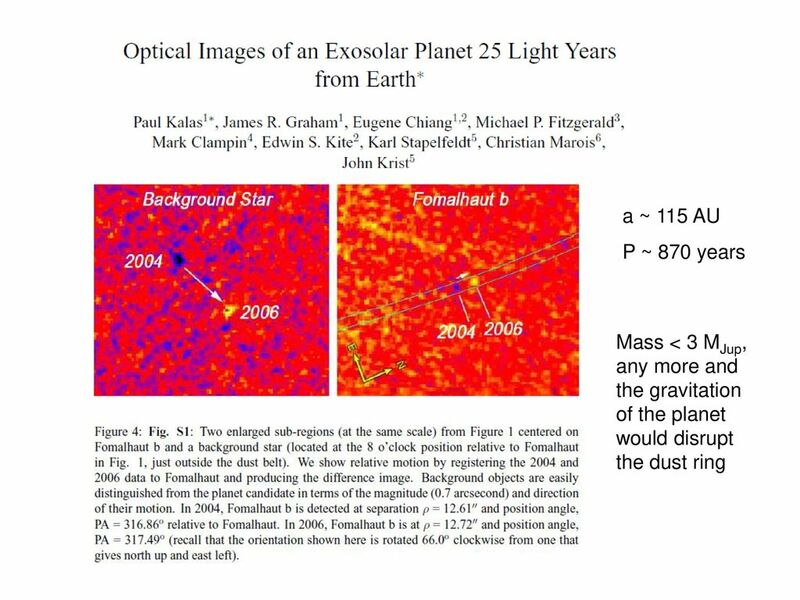 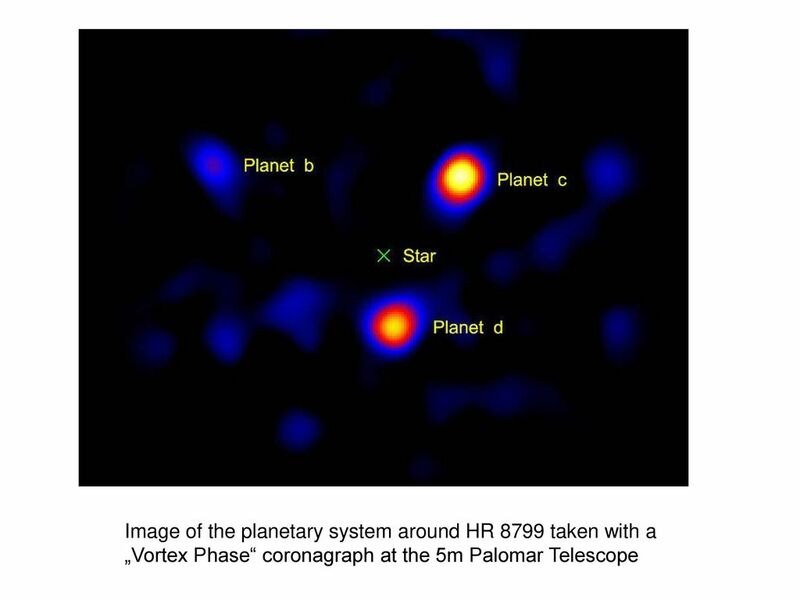 Download ppt "Direct Imaging of Exoplanets"
Error budget for the PRIMA conceptual design review Bob Tubbs, Richard Mathar, Murakawa Koji, Rudolf Le Poole, Jeff Meisner and Eric Bakker Leiden University. 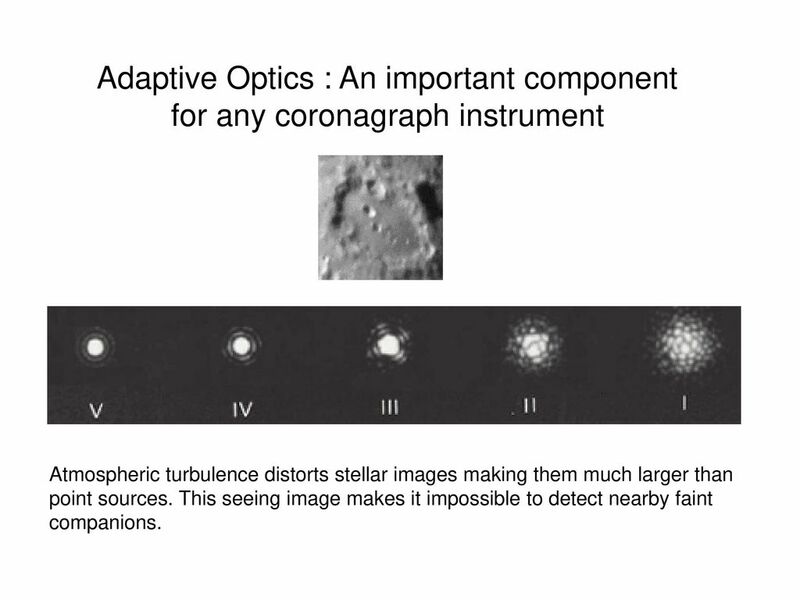 Chapter 5 Telescopes. 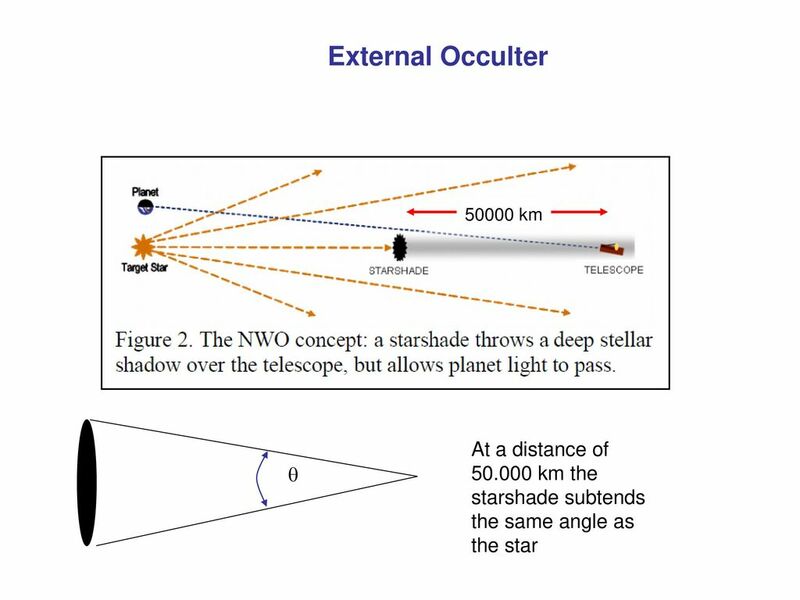 5.1 Optical Telescopes The Hubble Space Telescope 5.2 Telescope Size The Hubble Space Telescope 5.3 Images and Detectors Diffraction. 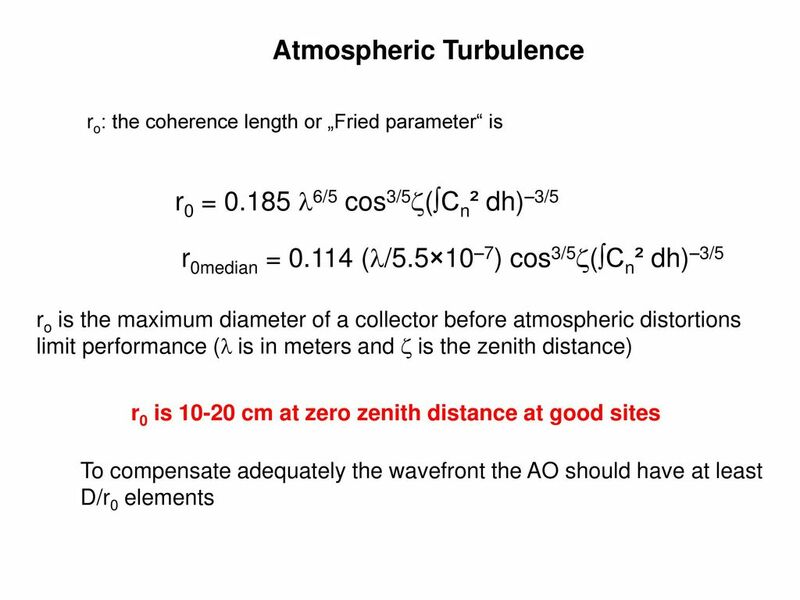 SIW 2003 The antenna element Ravi ATNF, Narrabri 1.The role of the antenna in a Fourier synthesis radio telescope 2.The Compact array antenna. 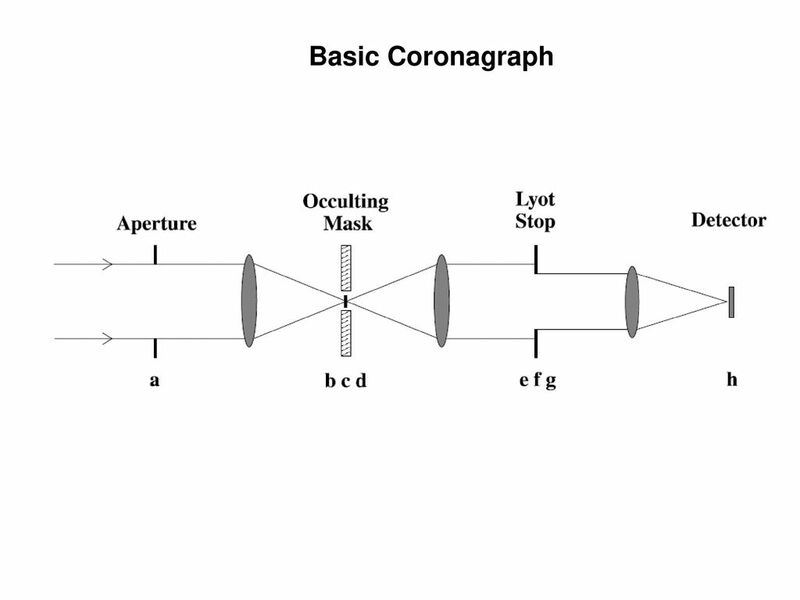 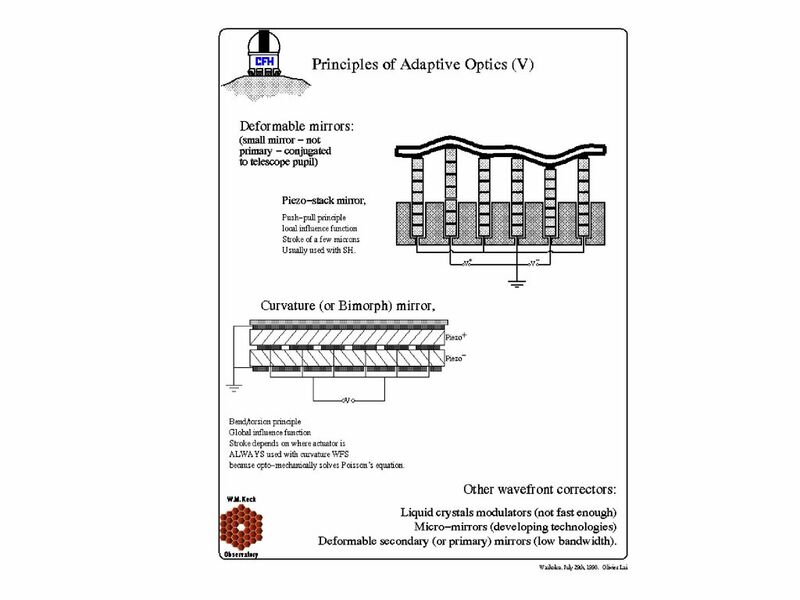 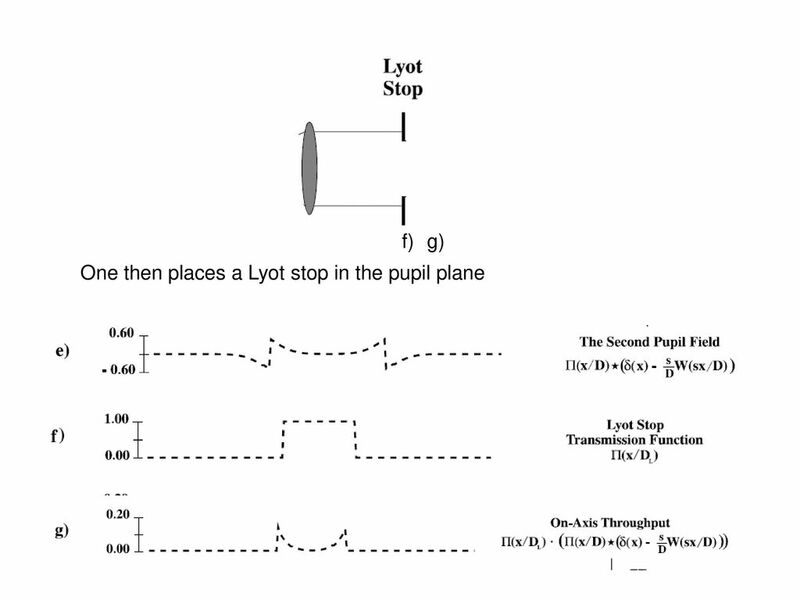 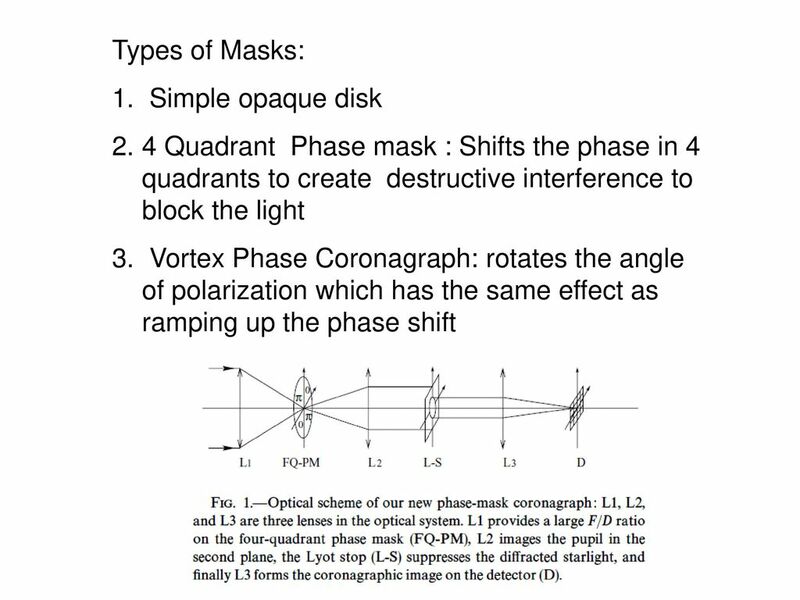 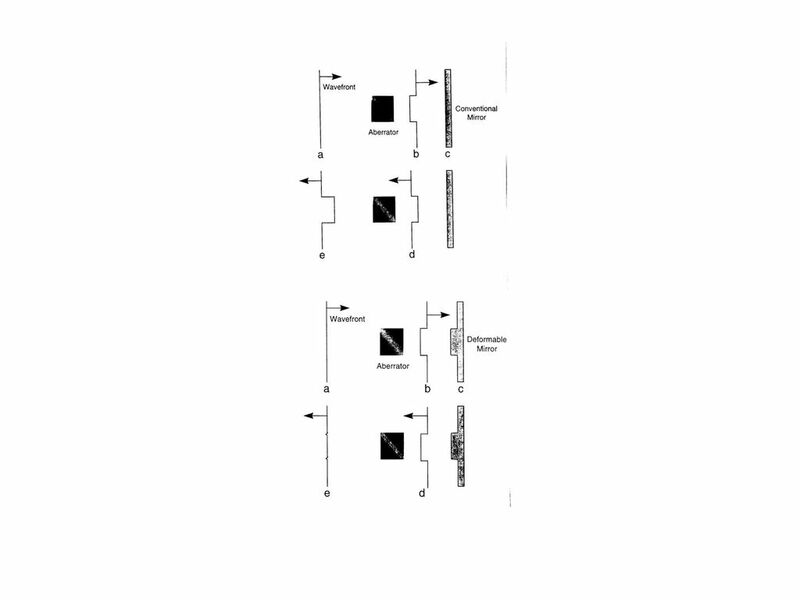 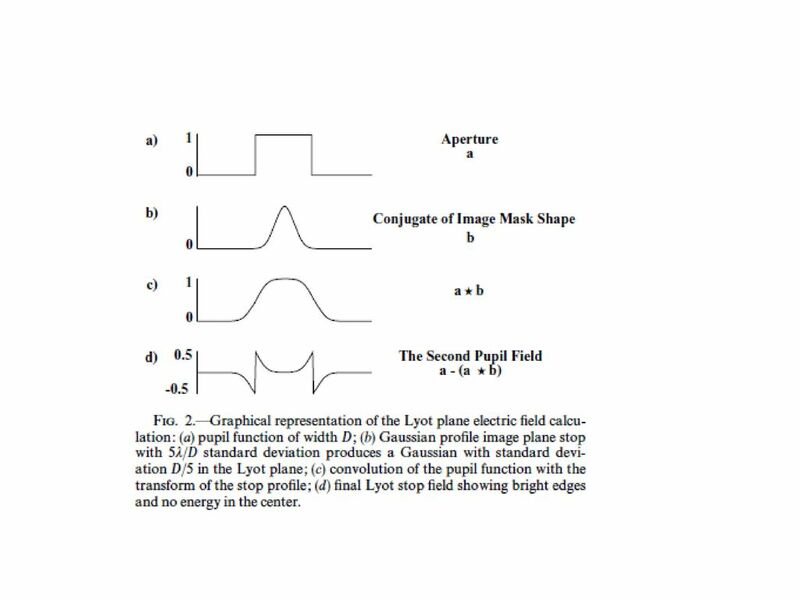 Chris A. Mack, Fundamental Principles of Optical Lithography, (c) Figure 3.1 Examples of typical aberrations of construction. 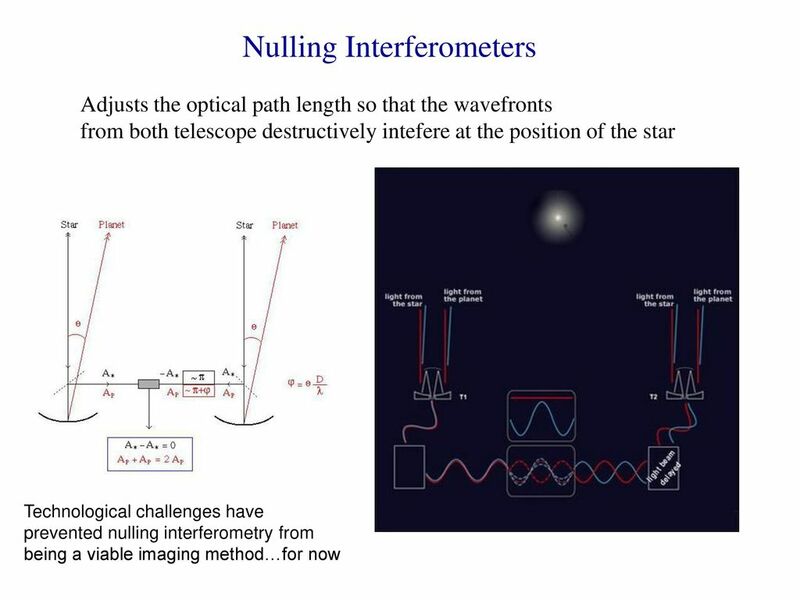 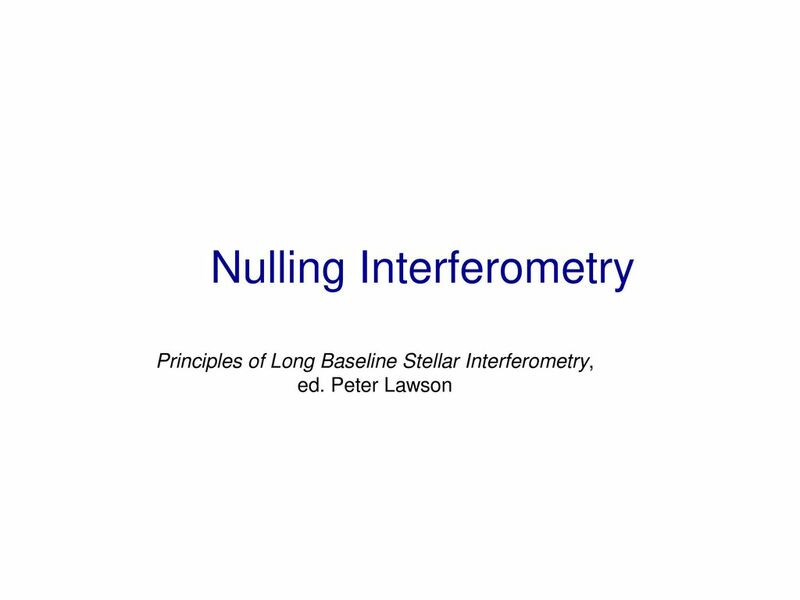 Intro to Stellar Astrophysics L21 The tools of astrophysics ä Virtually all information about the external Universe is received in the form of electromagnetic. 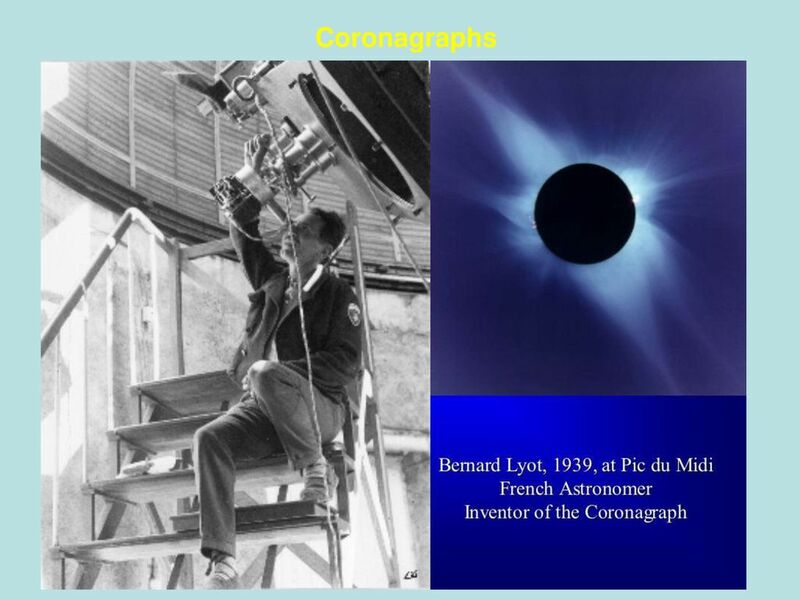 The Origin of Modern Astronomy Chapter 4:. 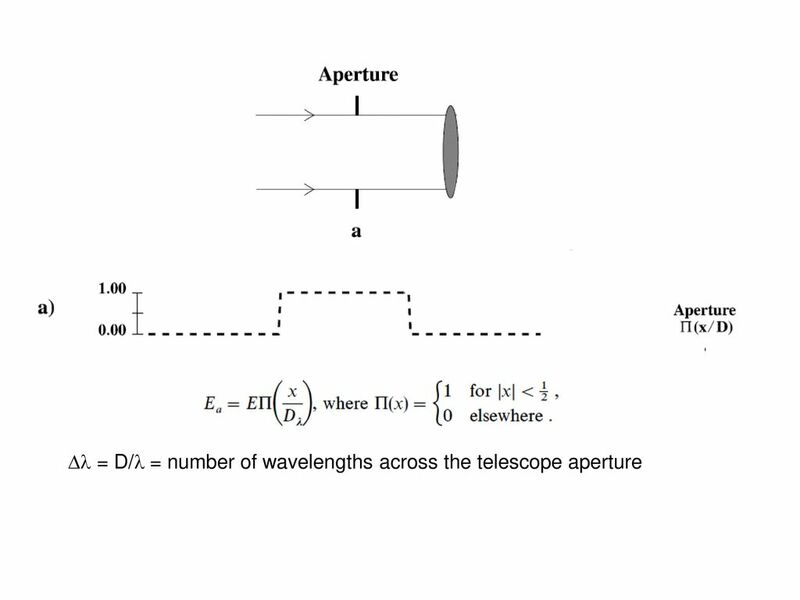 Isaac Newton 1689. 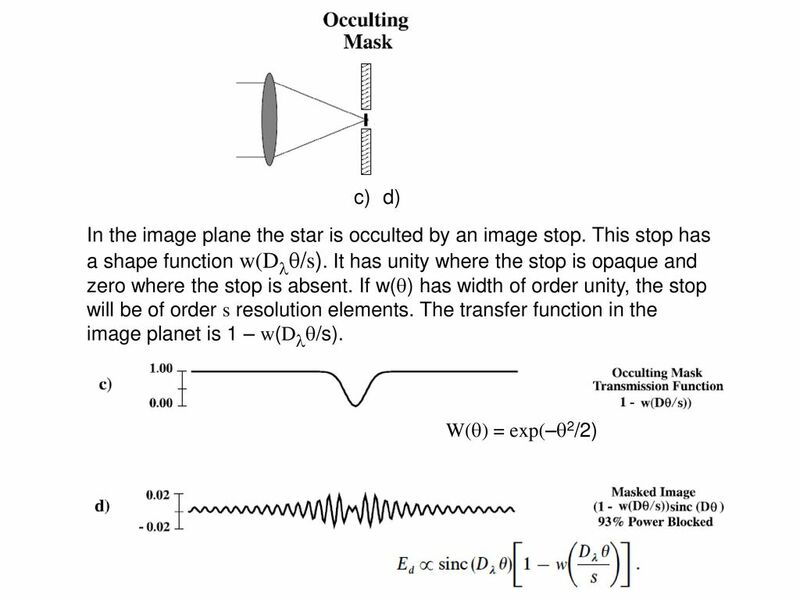 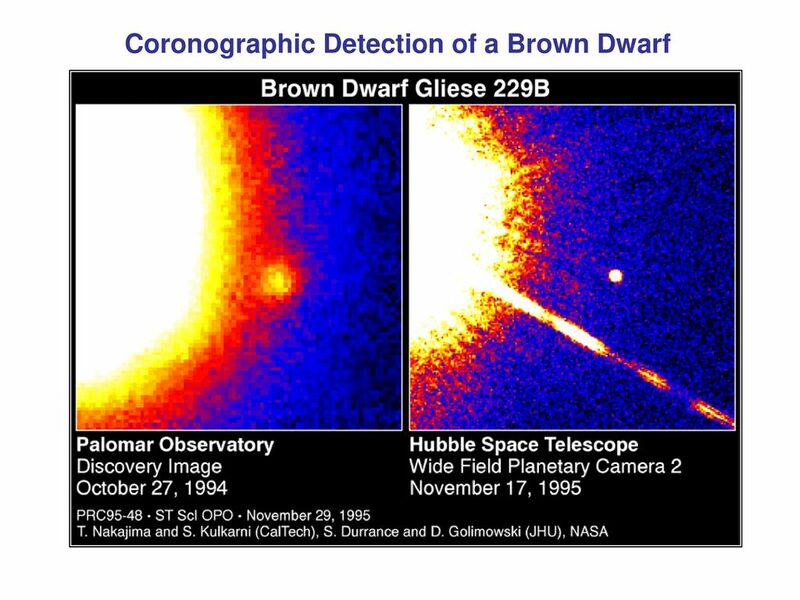 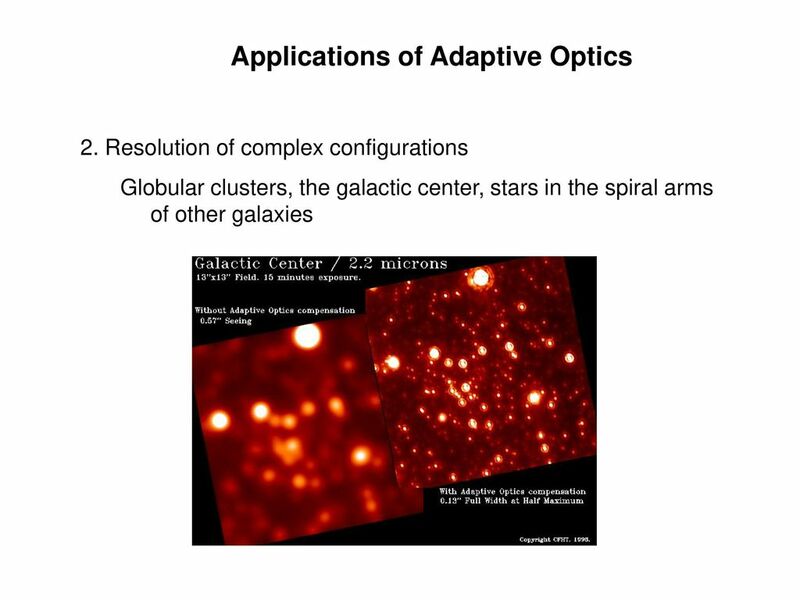 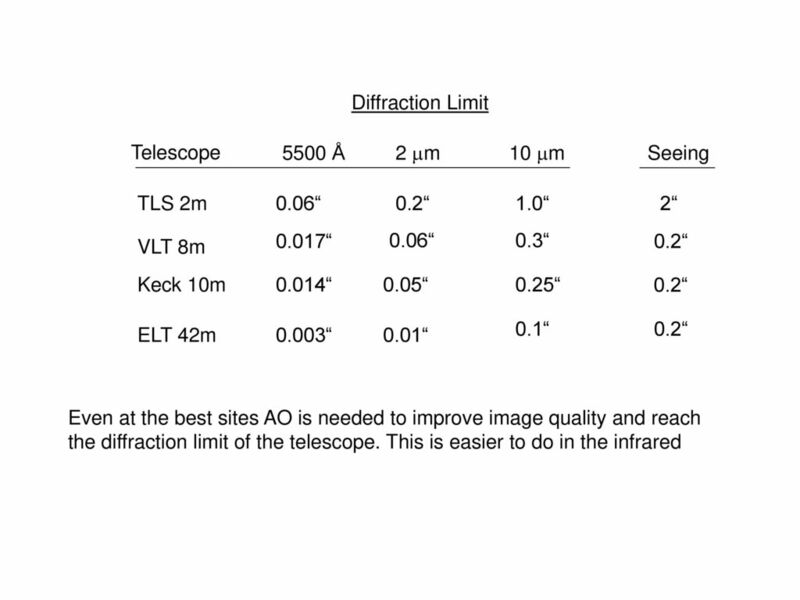 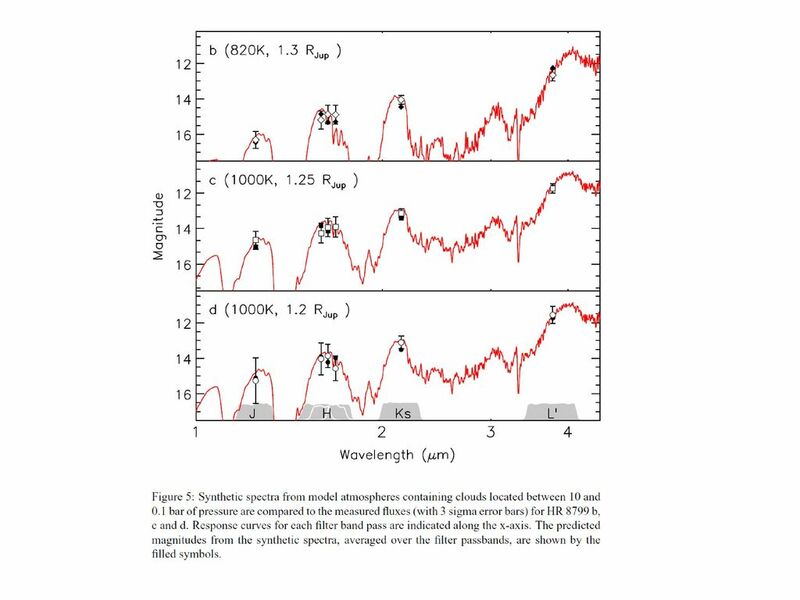 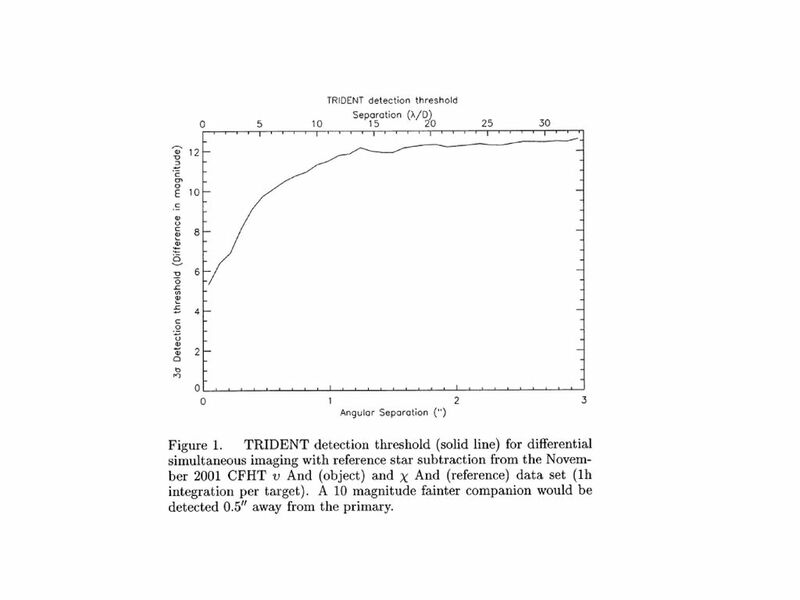 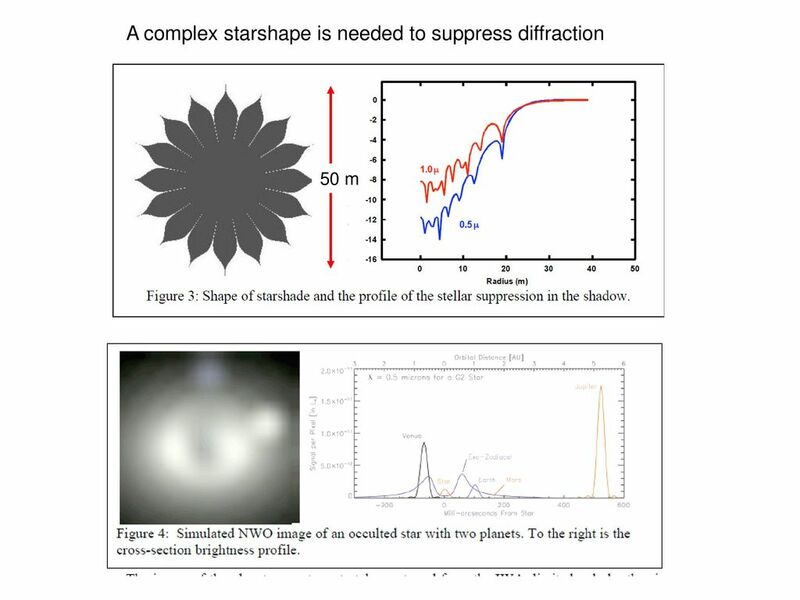 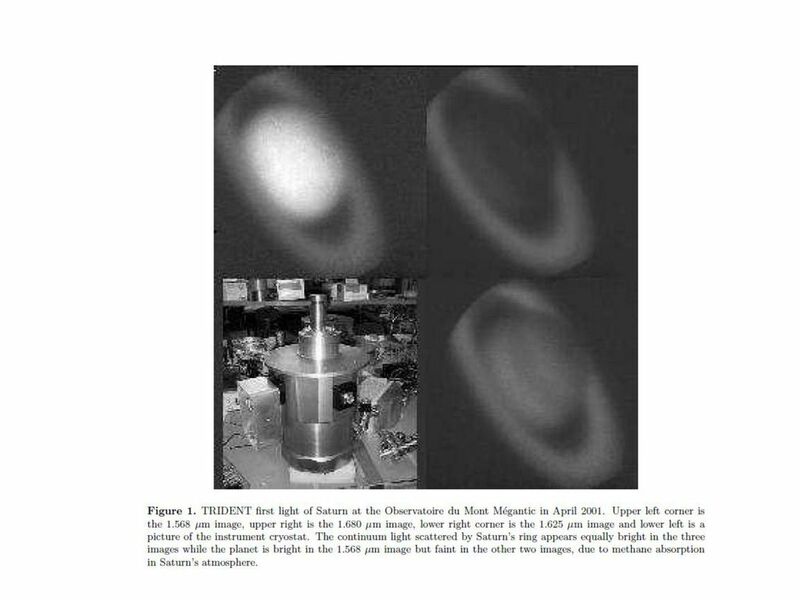 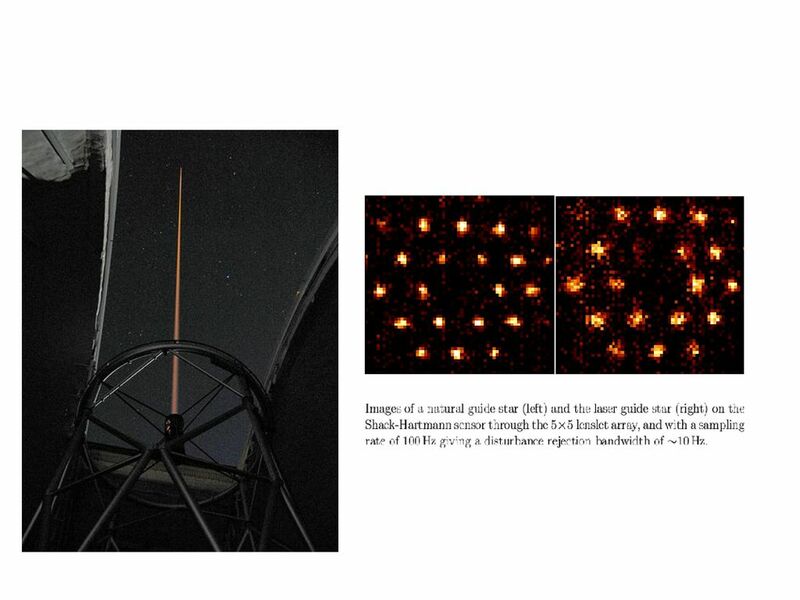 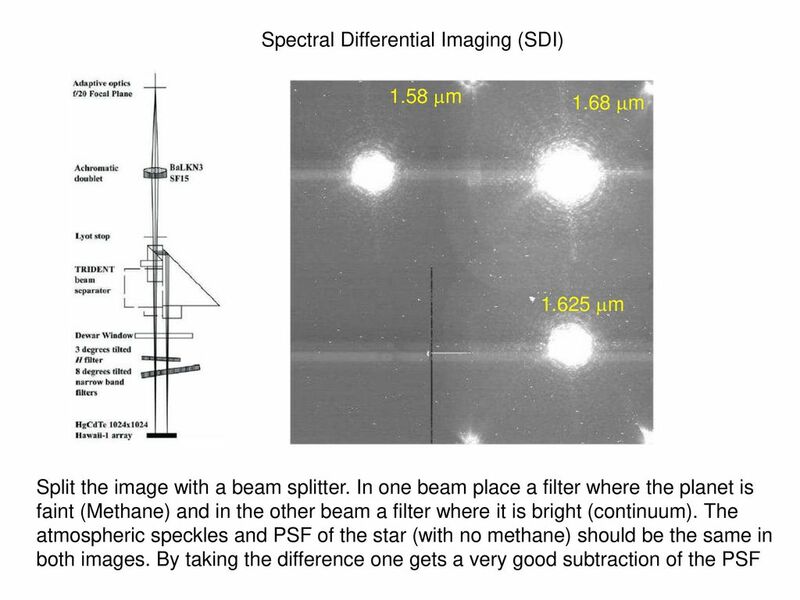 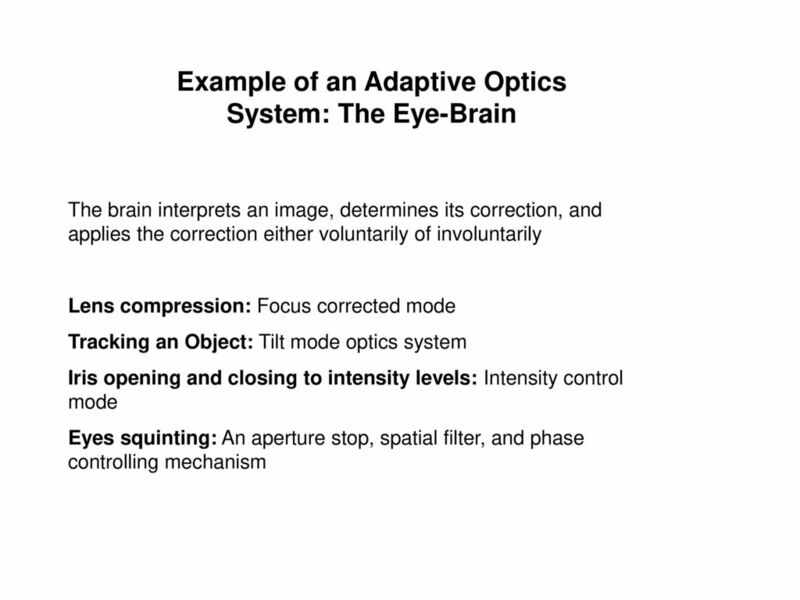 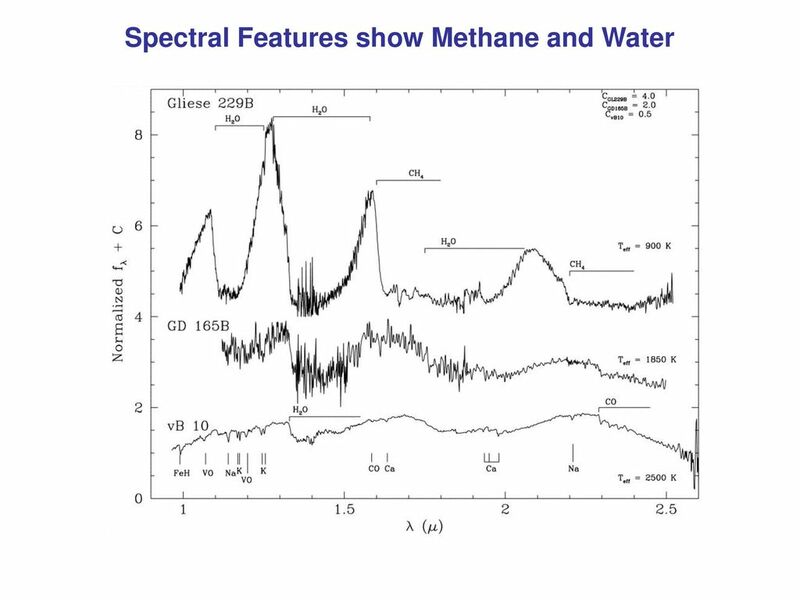 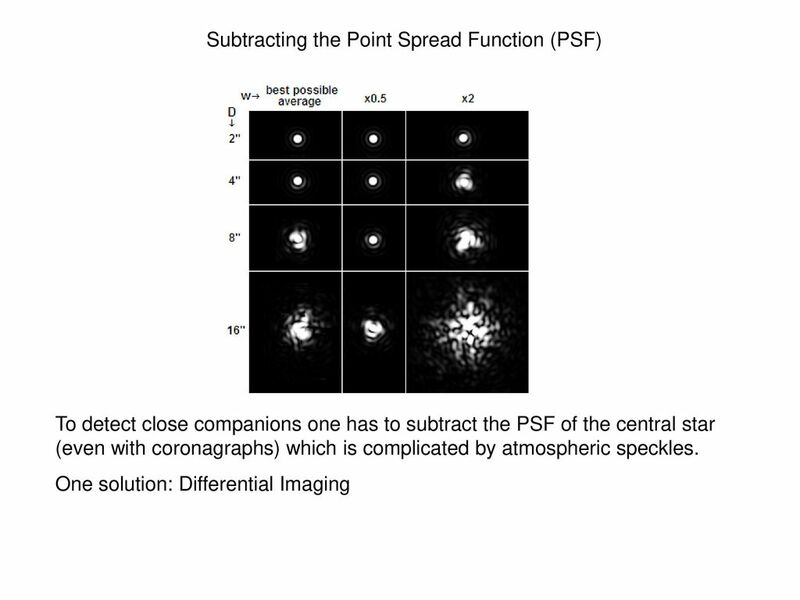 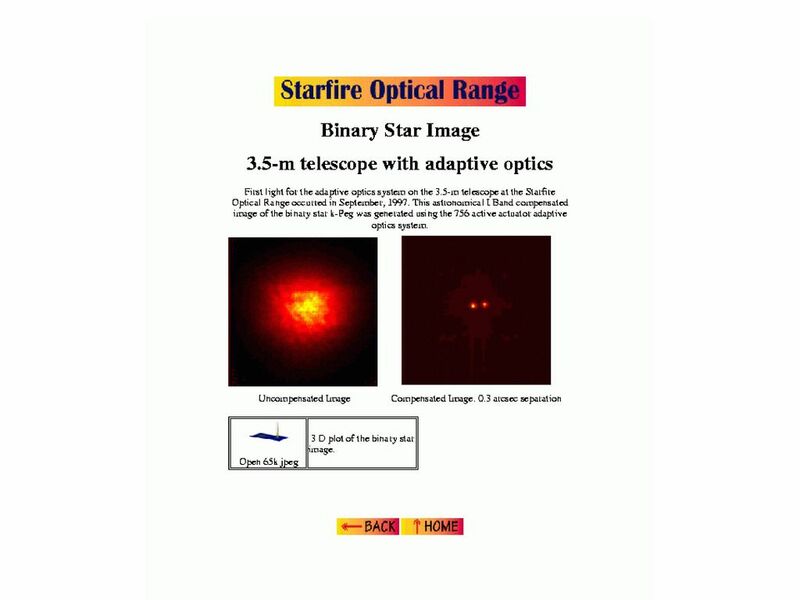 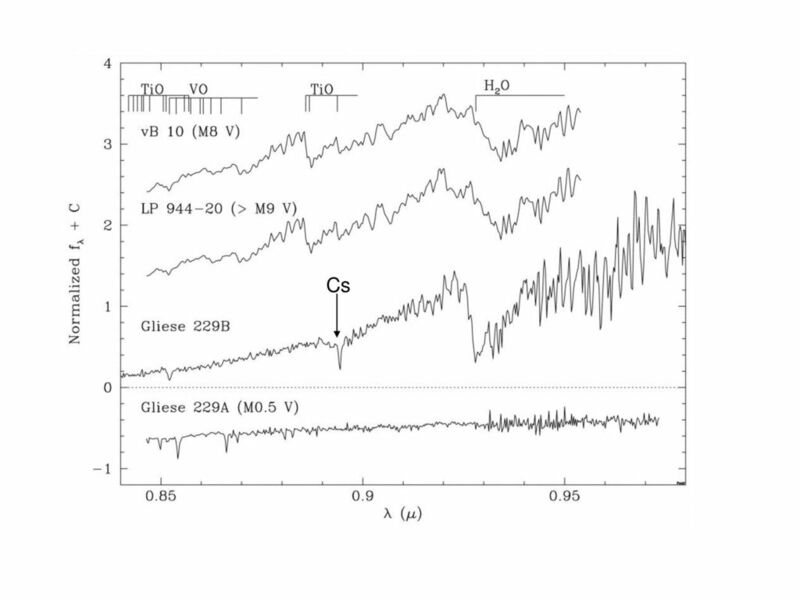 Adaptive Optics and Optical Interferometry or How I Learned to Stop Worrying and Love the Atmosphere Brian Kern Observational Astronomy 10/25/00. 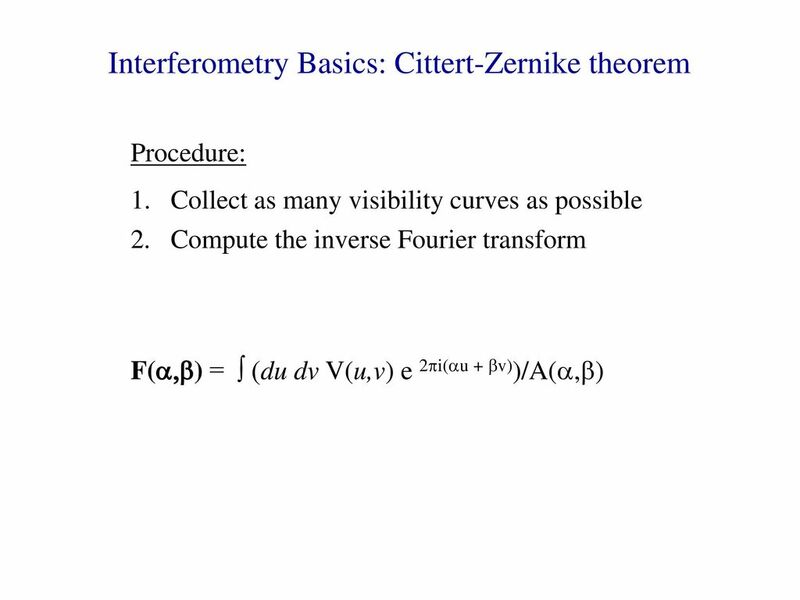 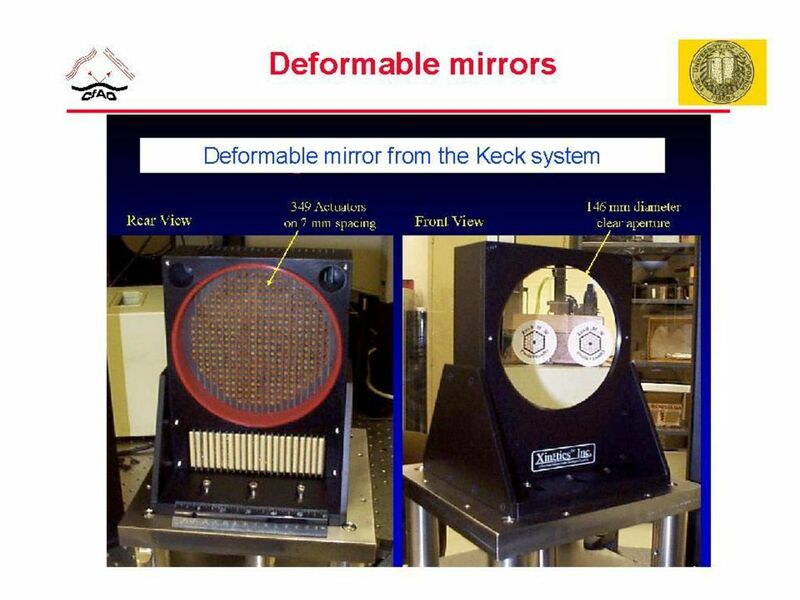 Optics in Astronomy - Interferometry - Oskar von der Lühe Kiepenheuer-Institut für Sonnenphysik Freiburg, Germany. 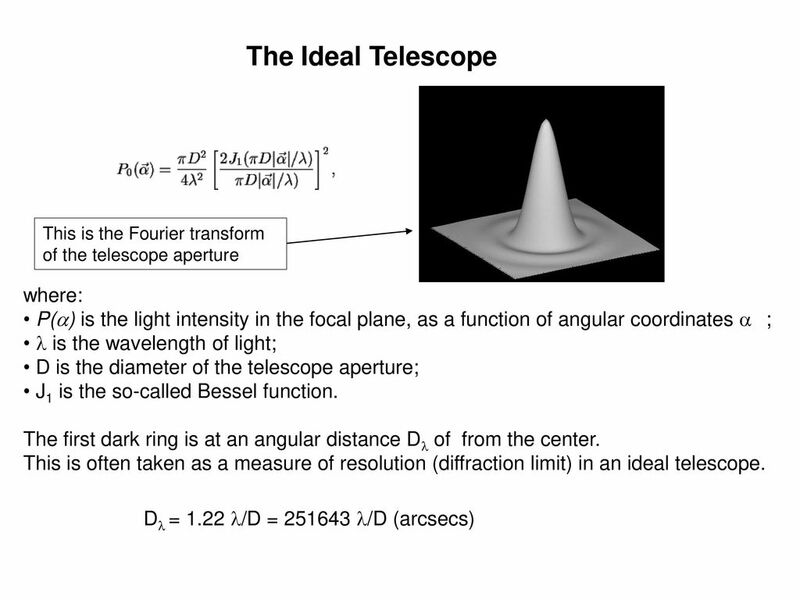 Telescopes (Chapter 6). 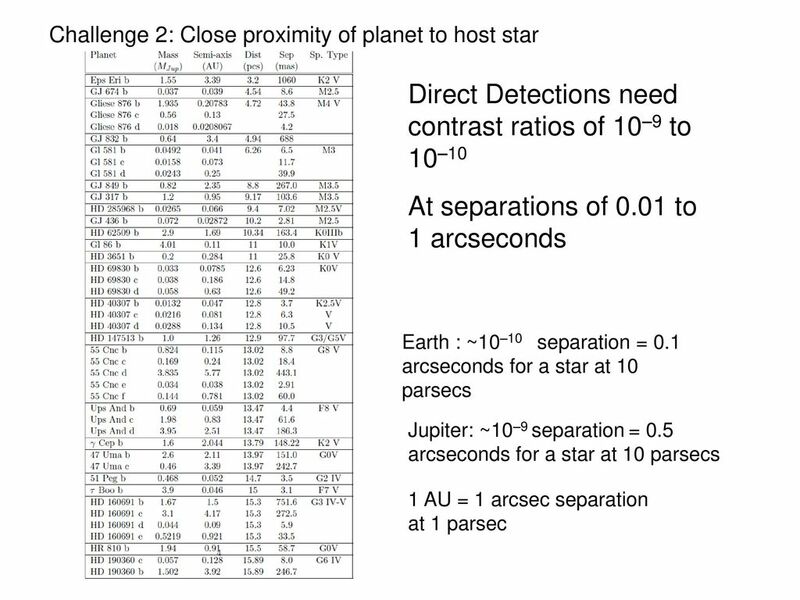 Based on Chapter 6 This material will be useful for understanding Chapters 7 and 10 on “Our planetary system” and “Jovian planet. 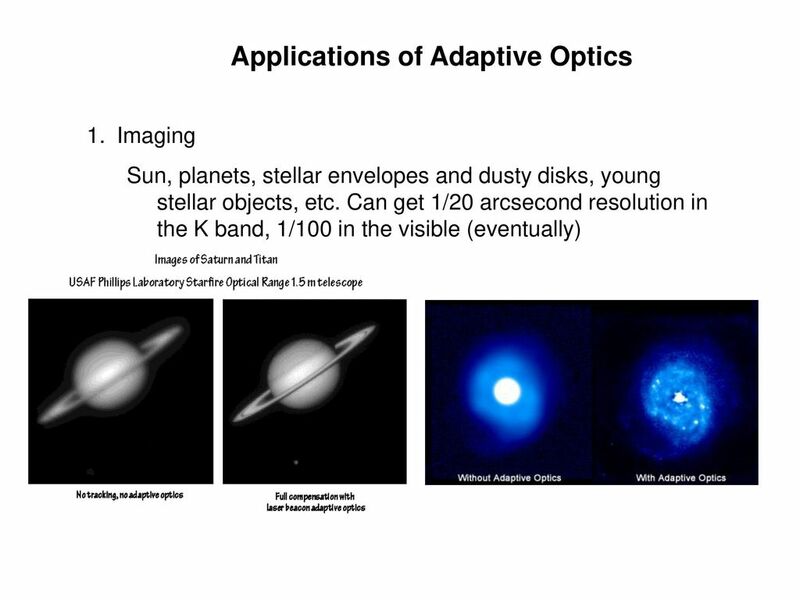 ASTRO 2233 Fall 2010 Adaptive Optics, Interferometry and Planet Detection Lecture 16 Thursday October 21, 2010. 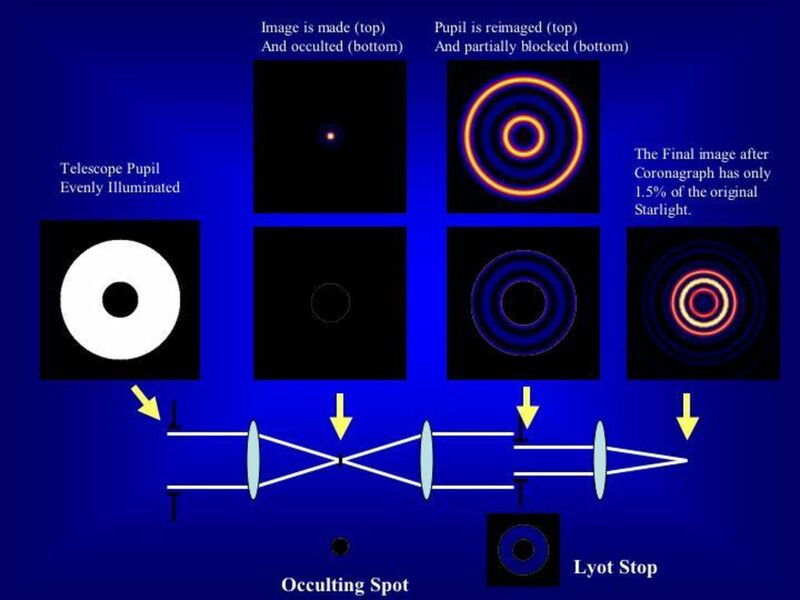 Slide 1 Light and telescopes Just by analyzing the light received from a star, astronomers can retrieve information about a star’s 1.Total energy output. 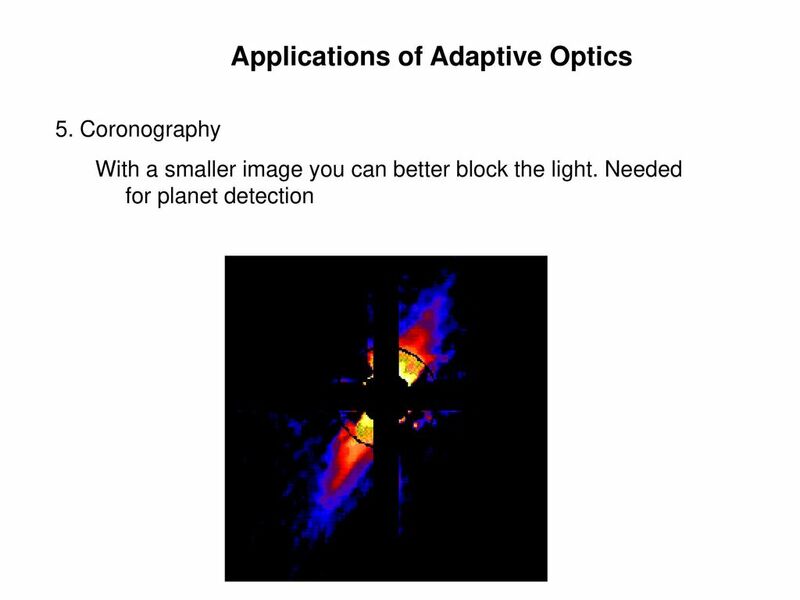 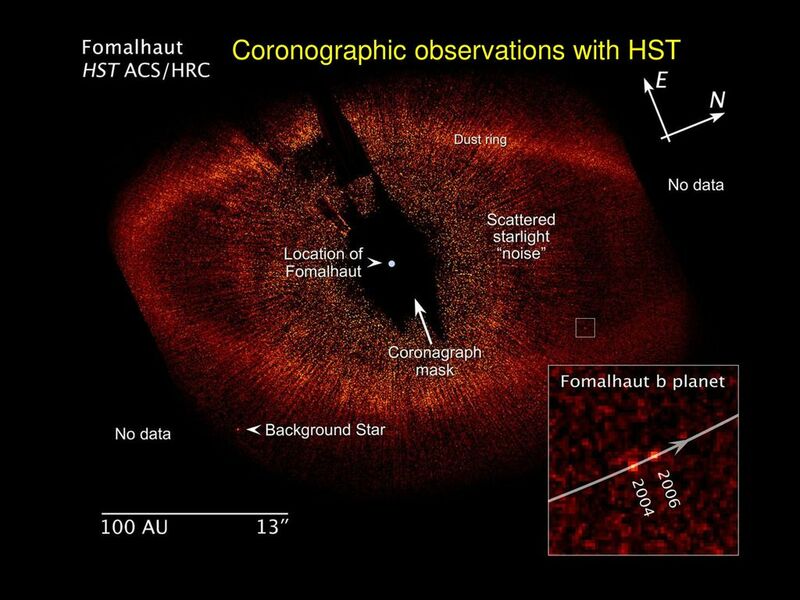 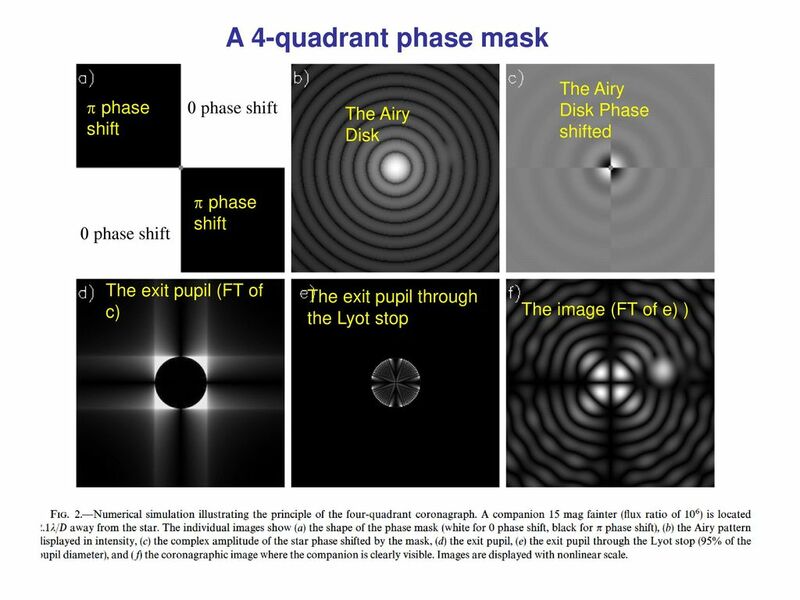 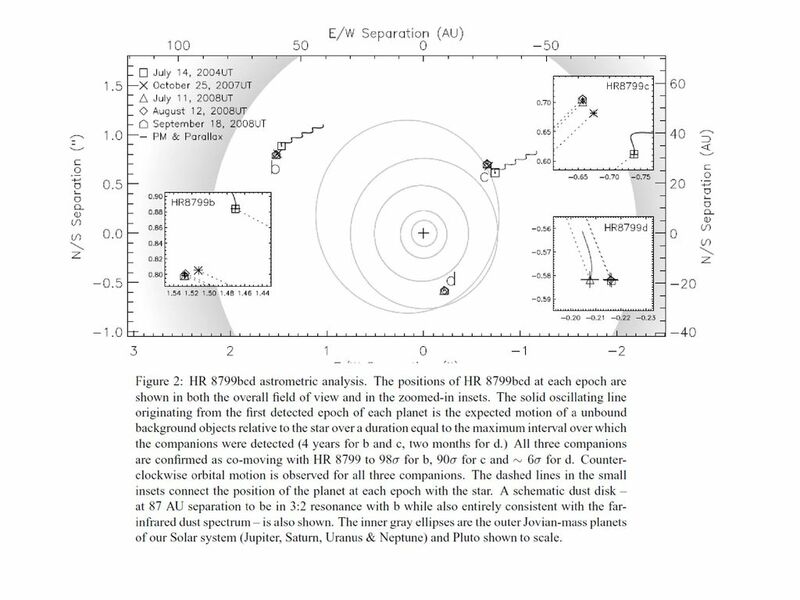 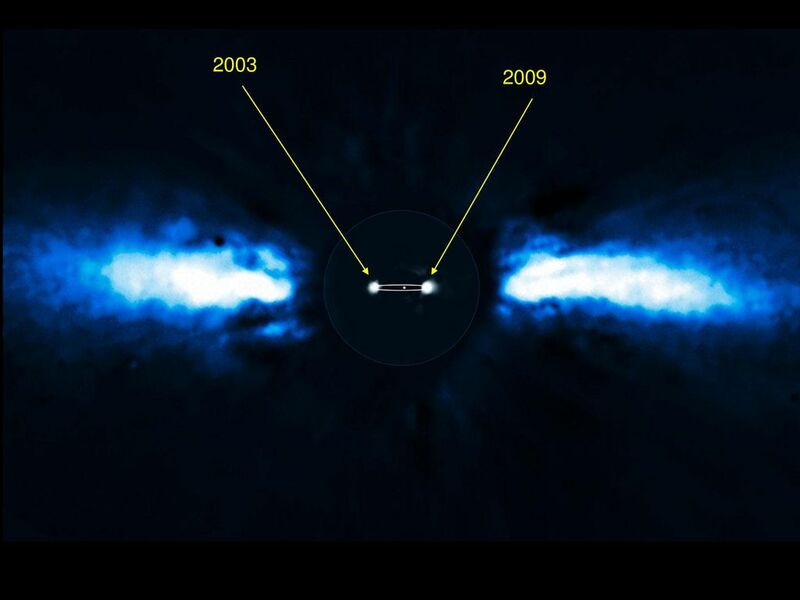 An Optimized Pupil Coronagraph: A New Way To Observe Extrasolar Planets This work was performed for the Jet Propulsion Laboratory, California Institute.